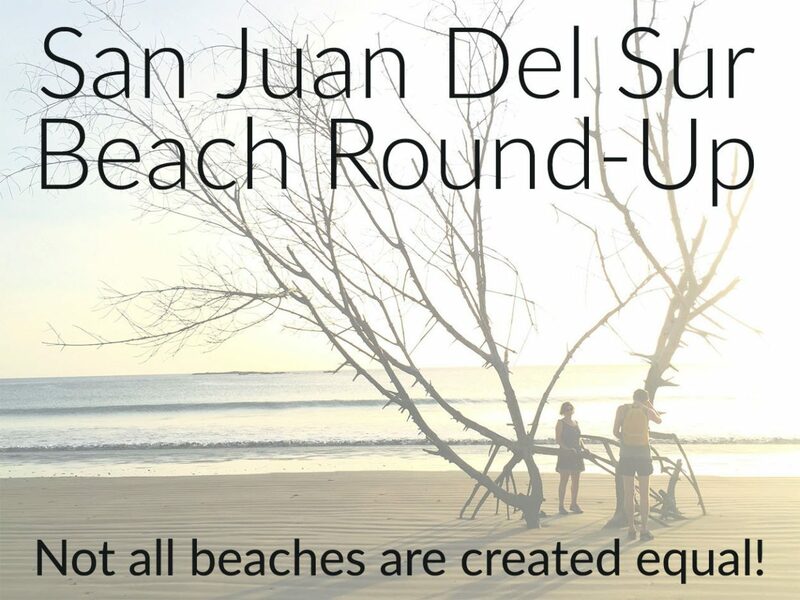 Home » Blog » Blog » Travel Tips » San Juan Del Sur Beach Round-up: All Beaches are Not Created Equal! 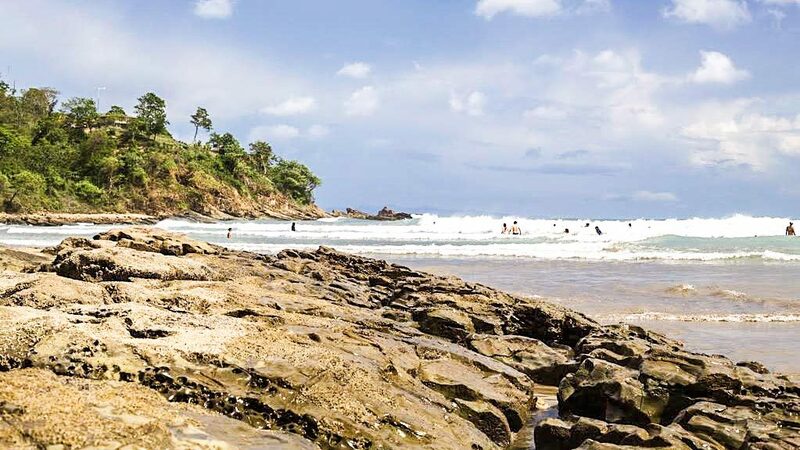 The southern Nicaraguan coast is a series of bays or coves, ringed with jagged and dramatic rock formations. 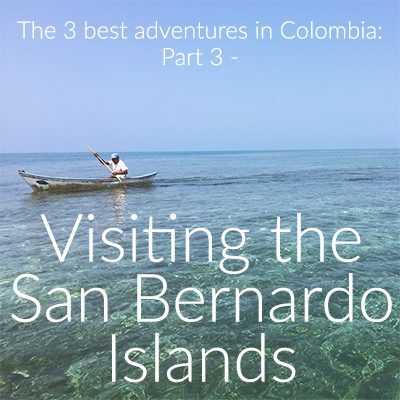 This makes for dozens of different beaches within a short distance from San Juan del Sur. Each beach is unique - with it's own geography, ocean currents, and patrons. 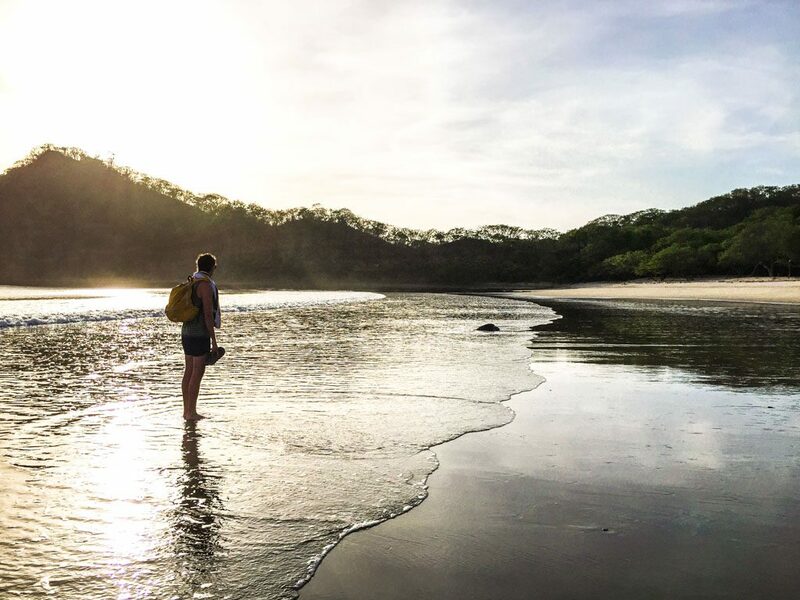 Part of the fun of staying in town is the easy access to explore all these different San Juan del Sur beaches, whether by shuttle, rental car, or taxi. 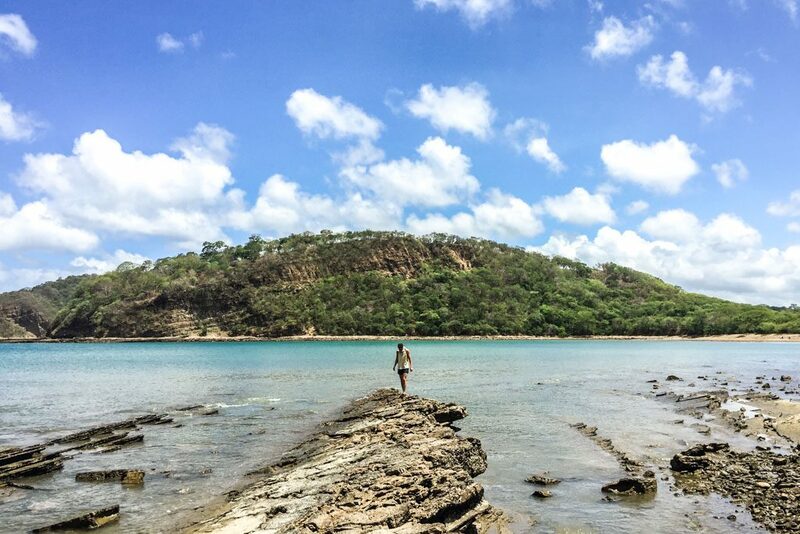 We explored 8 of the San Juan del Sur beaches during our stay, and each one was super different from the last. Some we loved more than others, but each was an interesting stop. We only stopped in Playa Blanca for about an hour during a Catamaran ride with Nica Sail and Surf. It was an absolutely gorgeous beach. 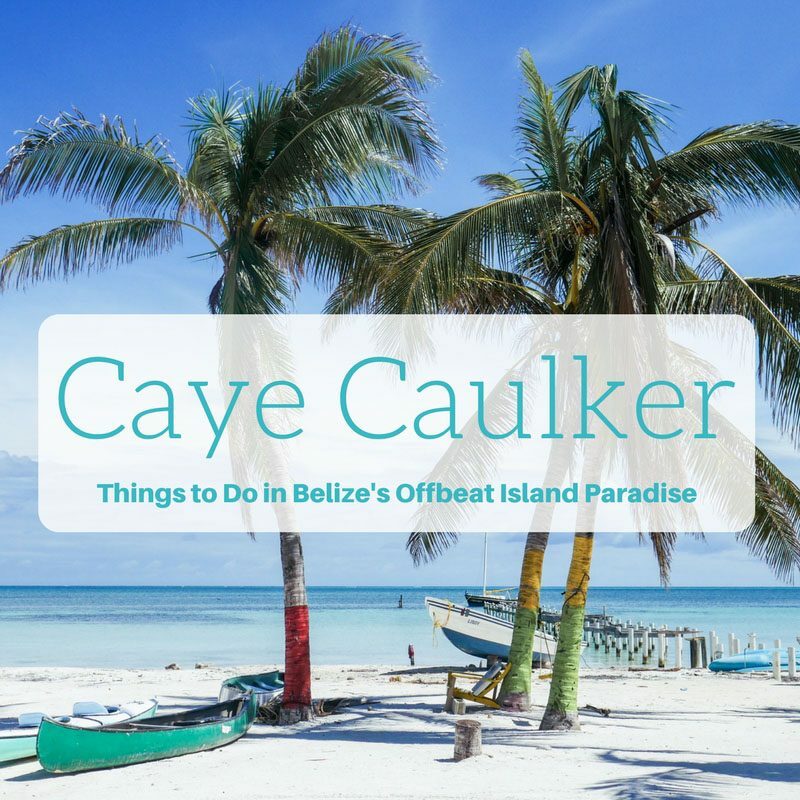 It's only accessible by sea (the land surrounding the beach is privately owned), but if you can make it there, it is a tranquil and serene place for a swim. 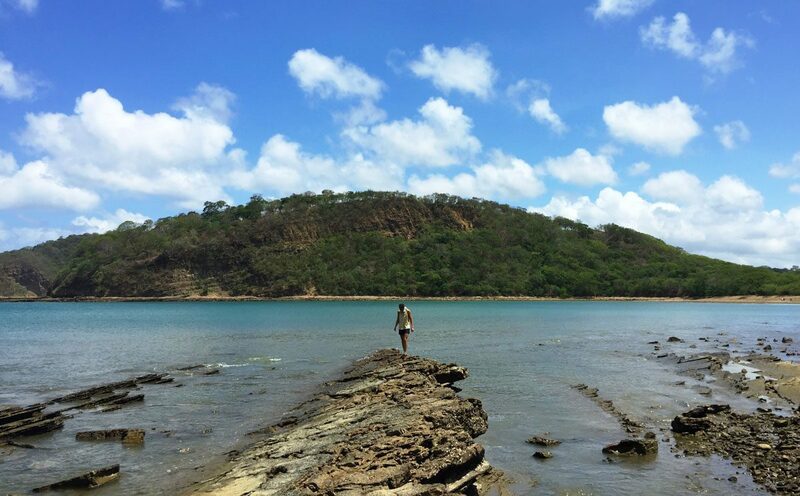 We jumped off our catamaran, swam through the calm waters to the beach, and spent a little time exploring the small white sand San Juan del Sur beach. 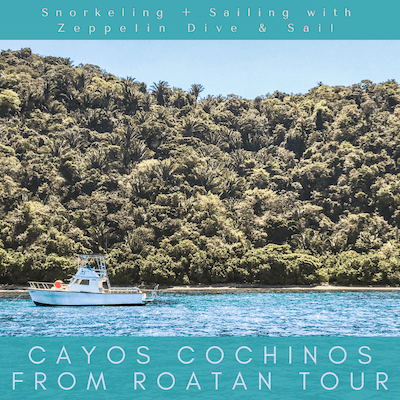 Hire a private lancha or book a catamaran cruise with Nica Sail and Surf (Highly recommended! 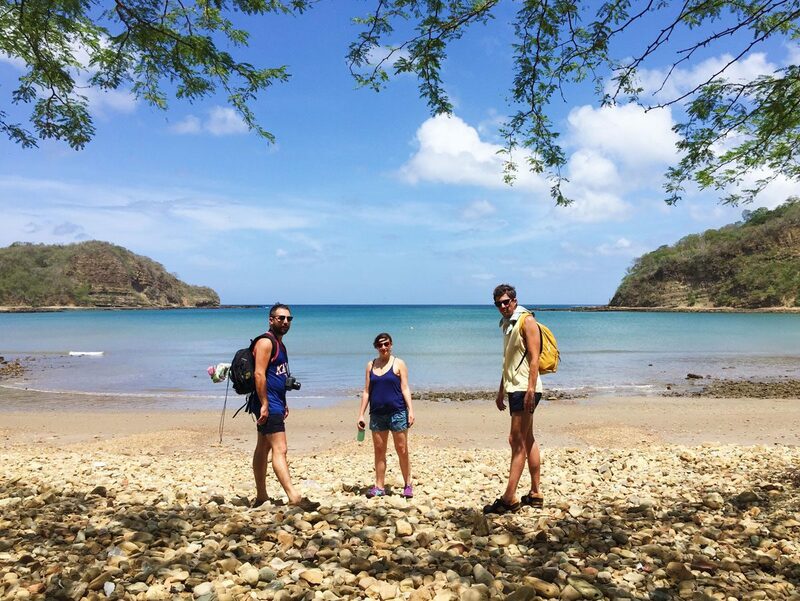 One of our favorite days in San Juan del Sur). This is a beautiful place for a calm swim. Also great for snorkeling if you have the gear. There are no amenities here. 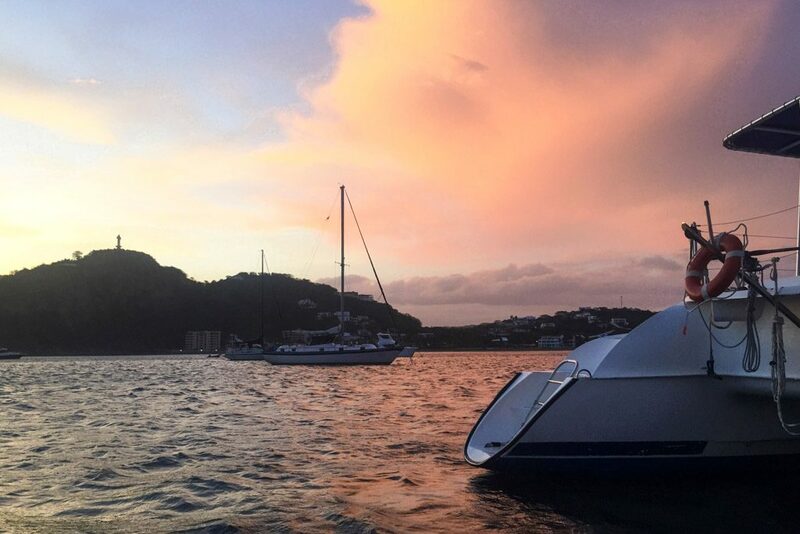 Bring your own food and drink, or eat fresh ceviche and drink til your heart's content on the catamaran cruise. A splurge day to have a beautiful and secluded beach hang. Hacienda & Ecolodge Morgan's Rock - Booking.com score of 9.4/10. 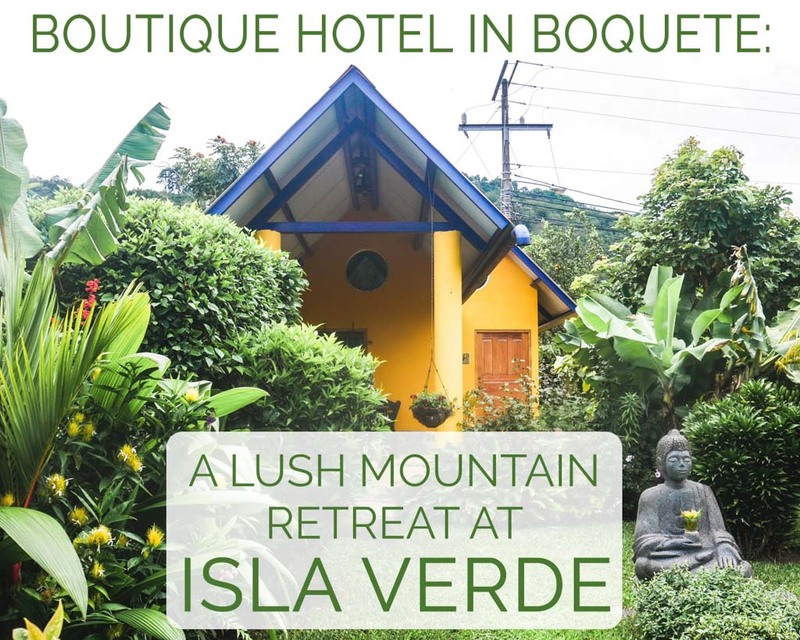 Average price is $379/USD night for a private double room. Gorgeous natural decor, jungle location overlooking the ocean. Pool. Breakfast included. 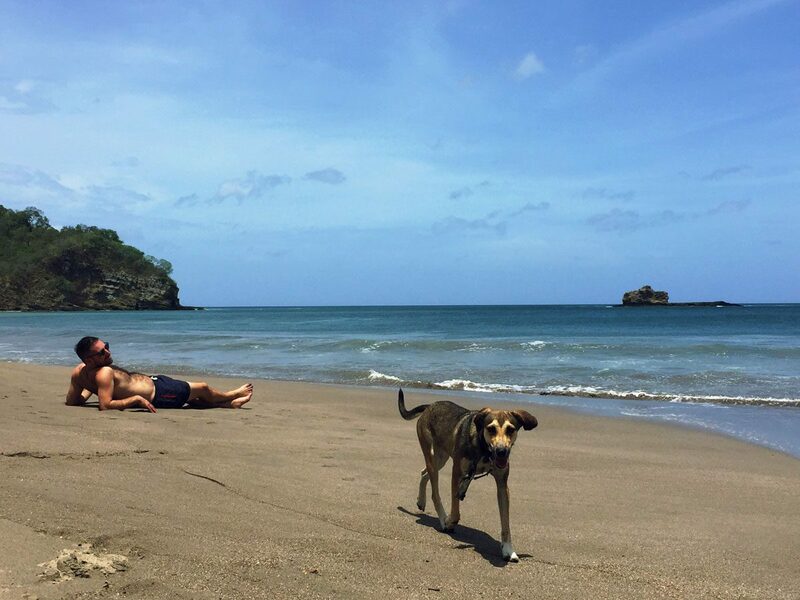 This is currently the most hip and talked about San Juan del Sur beach. It's a surfer's paradise - with one of the best surf breaks in the whole country. It also has very distinct rock formations, including the iconic "hook" in the north side of the sea. What surprised me most about Maderas is how small the beach is. There are three restaurants at the sand's edge, and they fill up almost the whole length of the beach. During low tide, you can cross over some of the lower rocks on the north edge of the beach to reach a very small additional sandy area. On a busy day, the beach can be quite crowded. 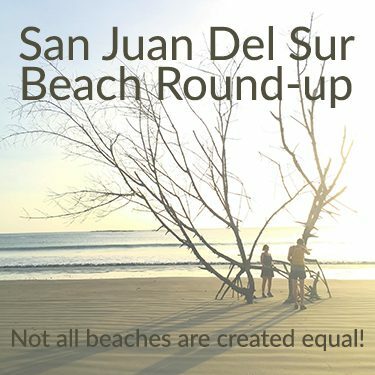 Take a $5 roundtrip shuttle from San Juan del Sur (you will see advertisements everywhere). Or take a $15-20 taxi (one way). Or hitch a ride! This is an excellent place to take surfing lessons. There are many little huts advertising lessons on the road to the beach. This is also a great place to swim. The ocean is shallow far out into the sea, making for a long walk out before getting even waist deep. You can usually have a nice swim in the gentler waves, while the surfers go further out for the bigger waves. As with any beach in Nica, be sure to shuffle your feet as you walk out, stingrays live here too! Of the three restaurants, I would recommend Tacos Locos. The wait was extremely long, but the tacos were fresh and delicious. If you plan to stay later into the evening, I highly recommend walking up the cliff to join family dinner at HulaKai Hotel and Restaurant. They serve an all you can eat meal of a main and several sides at 7:30pm each night for $15. We went twice and both times were incredible. Once we had filet mignon with stir fried veggies, greek salad, and butternut squash. Another time it was marinated chicken skewers, mashed potatoes, vegetable curry, and green salad. Be sure to email them before 3pm the day of to reserve your spot ([email protected]). People watching, learning to surf, and having a good time. HulaKai Hotel - Booking.com score of 9/10. Average price is $110/USD night for a private double room. Well designed hotel with a great view of the ocean. Big and pretty communal pool. 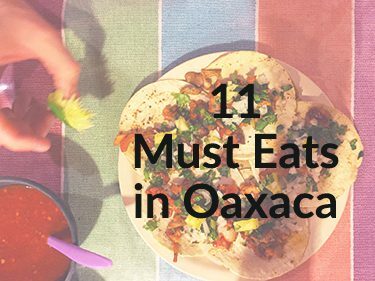 They also do fun and delicious family style dinners each night. Breakfast included. Arte-Sano Hotel Cafe - Booking.com score of 9/10. Average price is $ 90/USD night for a private double room. Artistically designed. Pool overlooking Maderas beach. AC + Ocean View Apt - Average price is $90/USD night for a full 1 bedroom apartment with kitchen. A nice option for people who prefer their own private space. 5 minutes walk to the beach. 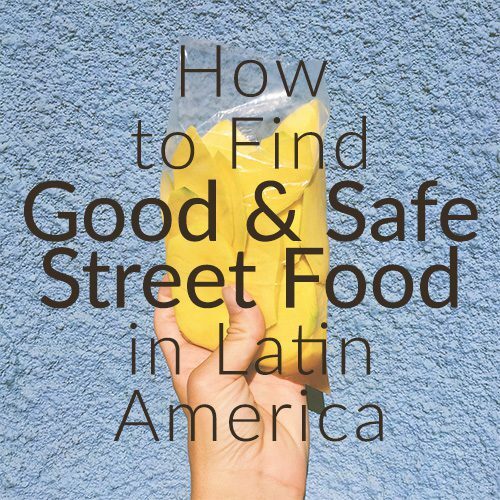 Be aware that Playa Maderas doesn't have any grocery stores, so this option would be better for those who have a car. 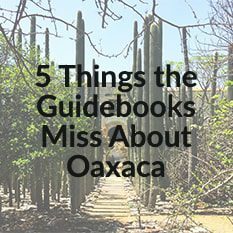 Otherwise you would need to hire a taxi to San Juan del Sur, or eat out at the Maderas restaurants. Playa Marsella is the sister beach to Playa Maderas, but is much different in it's vibe. It's much longer of a beach and is generally pretty empty and peaceful. The day we went, we shared the beach with only 5-6 other people and a few dogs. 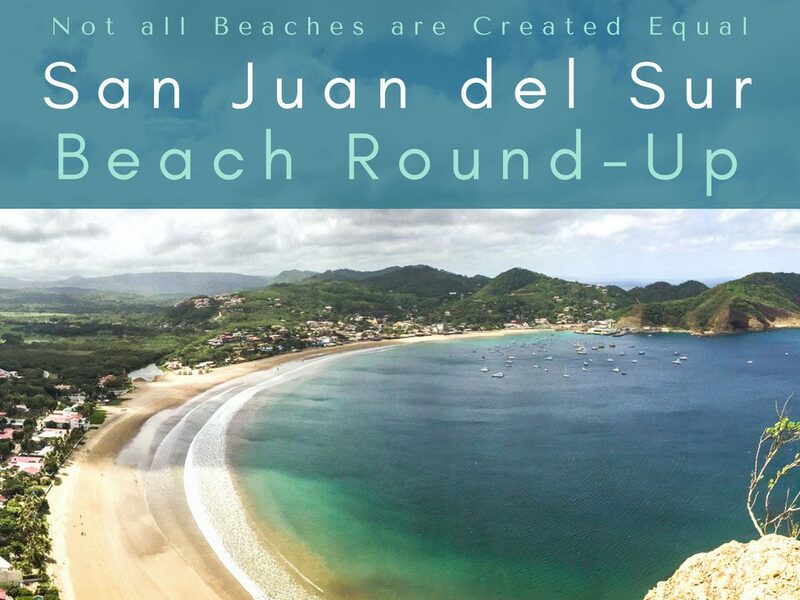 It's one of the perfect San Juan del Sur beaches for relaxing, reading, or sunbathing for hours. Same as Playa Maderas - Take a $5 roundtrip shuttle from town (you will see advertisements everywhere). Or take a $15-20 taxi (one way). Or hitch a ride! This isn't a surfing beach - the waves are generally very calm here, which makes for a great swim. There are two restaurants here - Restaurante Rancho Marsella at the entrance, and El Secreto further down at the south end of the beach. I didn't eat at either, but my friend ate at Rancho Marsella and said that it was great basic food at a good price. A relaxing, peaceful, tranquil afternoon swim. 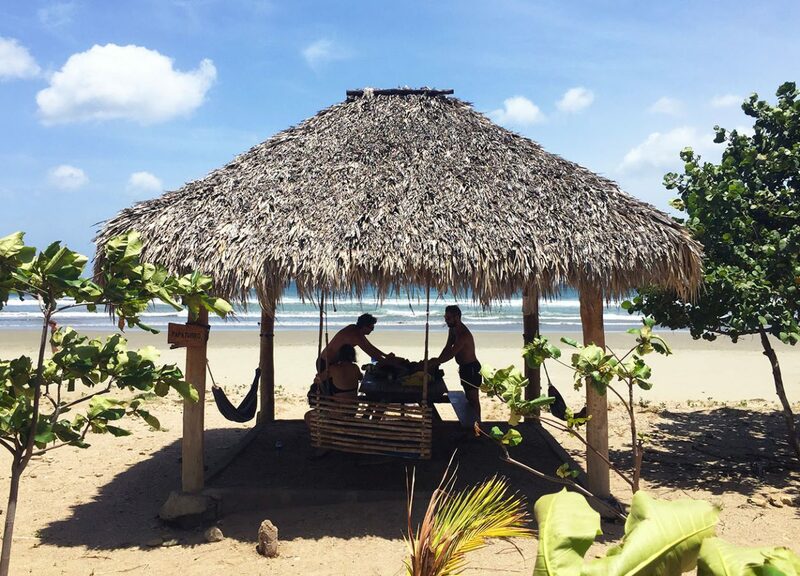 Casa Bahia Family Adventure & Surf Hotel - Booking.com score of 8.2/10. Average price $108/USD night for a private double room. Ocean views, pool, 2 minute walk from the beach, breakfast included. Mango Rosa Resort - Booking.com score of 8.1/10. Average price $98/USD night for a private double room. Pool and large common areas. Rooms are slightly on the basic side but comfortable. 1km from the beach. 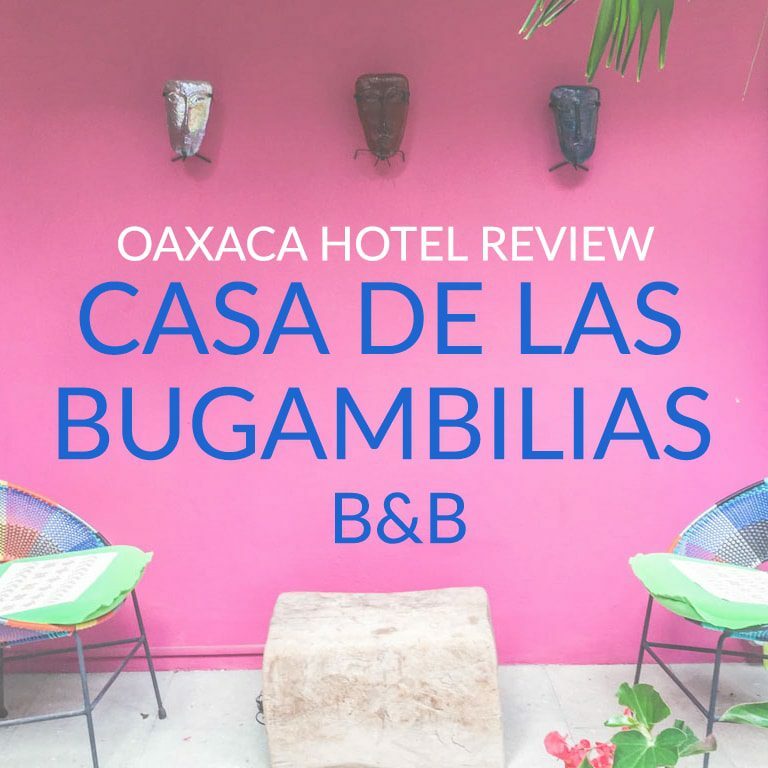 Casa la Ceiba - Average price $35/USD night for a private double room with shared bathroom. Hostel is 2 minutes walk from the beach and has a/c. Some rooms have kitchen facilities. 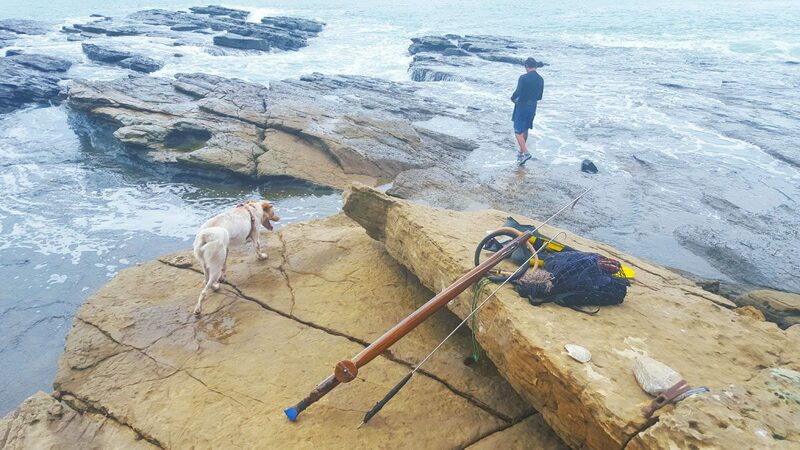 On a fishing trip with our local friend, Oscar, who uses a traditional dive and spear fishing method. 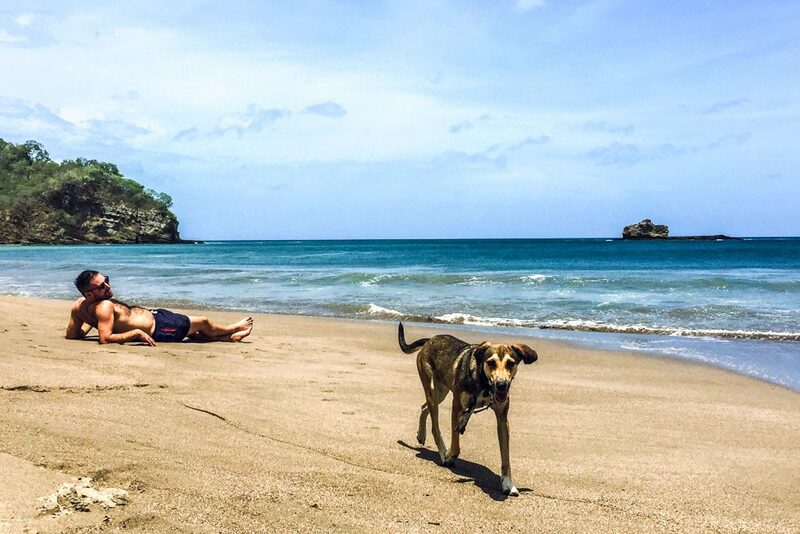 This is a totally untraditional San Juan del Sur beach that you will find almost no information about. It's a mostly rocky bay just north of the San Juan del Sur town bay. It's not a good place to go for swimming/surfing/sunbathing, but it is a beautiful place for exploring and hiking around. 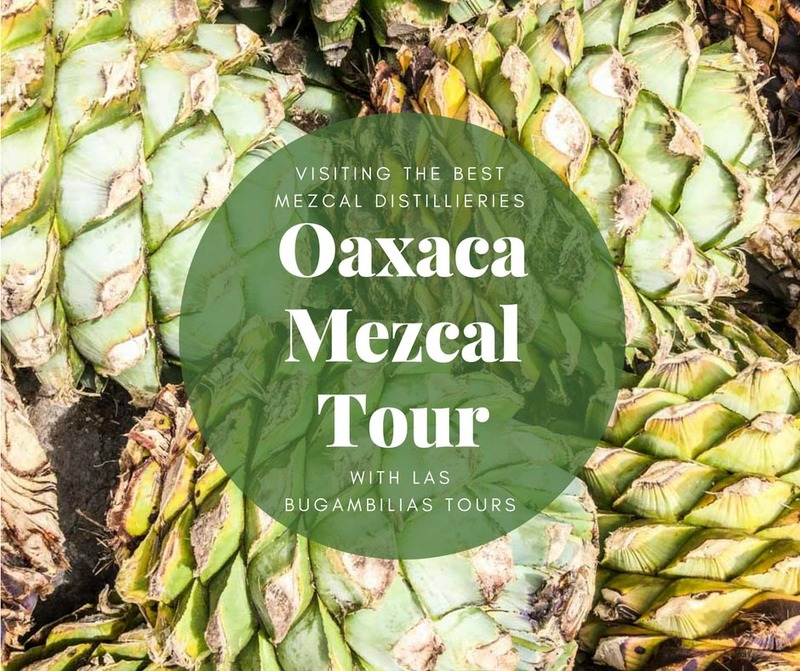 No shuttles will advertise this as a destination, but you might be able to ask them to drop you off on the way to Playa Marsella or Playa Maderas. Or you could take a $10 taxi (one way) from town. We were staying in the community of Los Miradores, directly up the hill from Nacascolo. We would gaze down at the bay each day which made us so curious to see it up close. 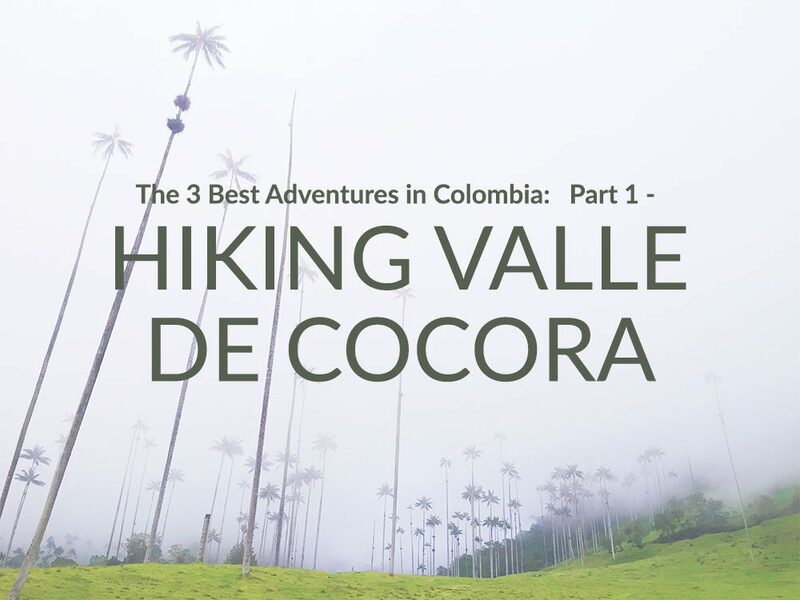 We learned from our home's caretaker that we could walk down to the main road (Chocolata) and walk north only a few meters before finding a footpath that heads down to the bay. From our home, it was about a 15 minute walk. 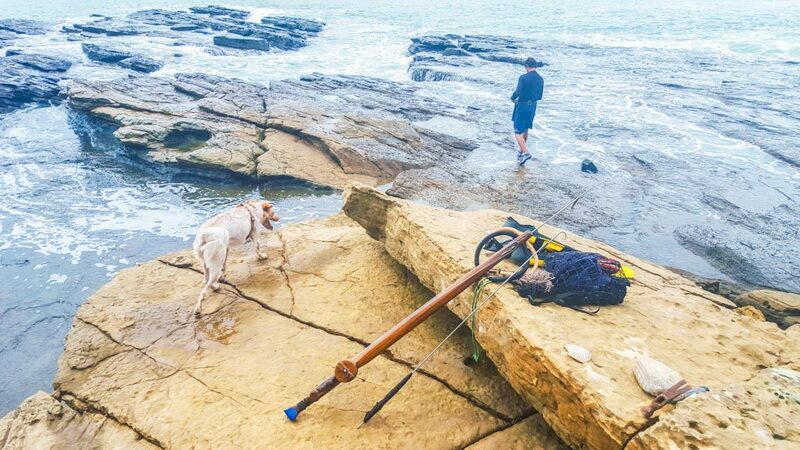 This rocky beach is perfect for exploring and seeing sea life. Be sure to wear good hiking shoes or hiking sandals as you'll be walking over rocks big and small. You can walk almost to the edges of the bay if you're comfortable climbing up and down the rock formations. Just be sure to be aware of the tides so you don't get stuck at the end when the tide comes in. Swimming is possible but most of the shore is rocky. We did spy one sandy beach at the north end of the bay. My husband and our friend went here another morning with our local friend who fishes here often. He showed them the traditional way of free diving and catching fish with a spear. This is a very local spot! 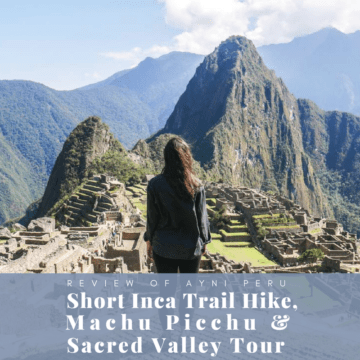 Very interesting if you want to get off the tourist path. We did hear several warnings from locals about coming here. There are apparently thieves/robbers who sometimes prey on people here. It is very empty, we only saw one small group of locals there when we went. I can see how you might be vulnerable there. Best to always take precautions - leave valuables at home, go in groups, and be aware of your surroundings. Also, there are zero amenities here so be sure to bring lots of water, sunscreen, and a snack if needed. This San Juan del Sur beach area is very residential, so is great for using Airbnb or Vrbo to rent your own vacation home. This is the area we stayed in a lovely rental home and it was extremely tranquilo with gorgeous views of the bay. Because you're removed from town, it does take awhile to get anywhere, especially if you don't have a car. But the peaceful atmosphere is amazing! 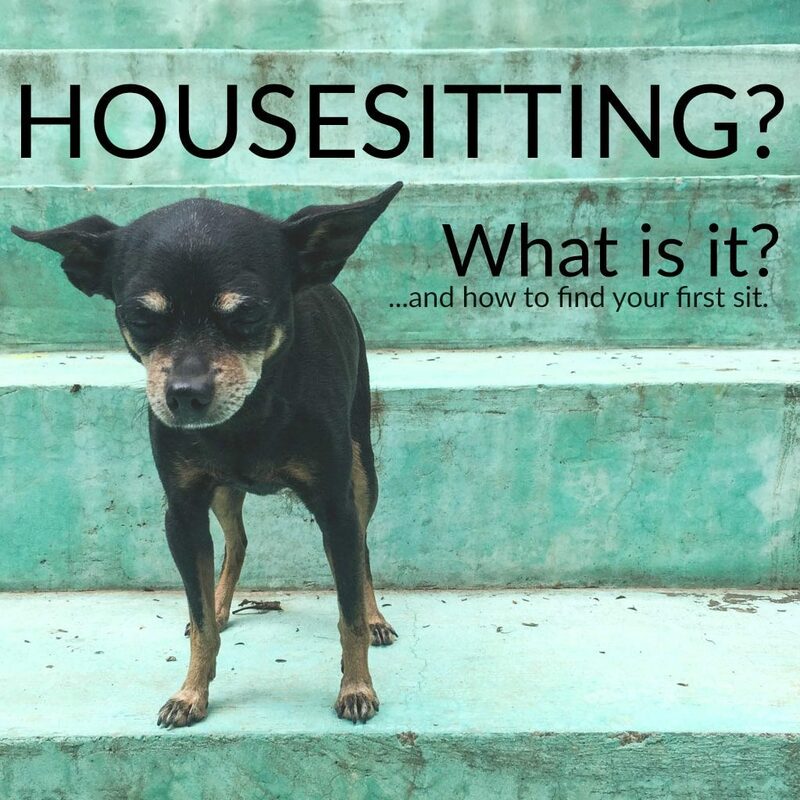 Airbnb - Click here to get $40 off your first Airbnb stay! Casa Luna - Average price $260/USD night for a home that sleeps 5 people with full kitchen and private pool in a residential community. The wide open beach looking towards the Jesus statue on the southern cliff. Sunset from a boat in the bay at San Juan del Sur beach. 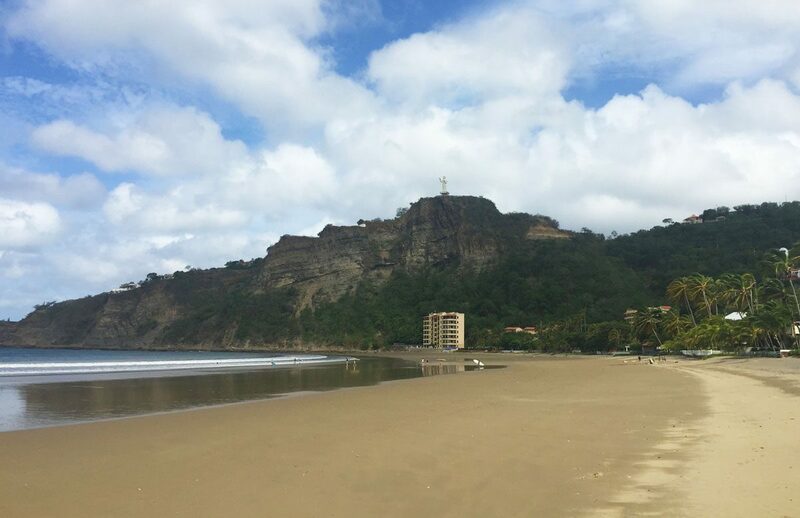 The San Juan del Sur beach directly in town is not the prettiest beach in the world, but it is actually quite picturesque. 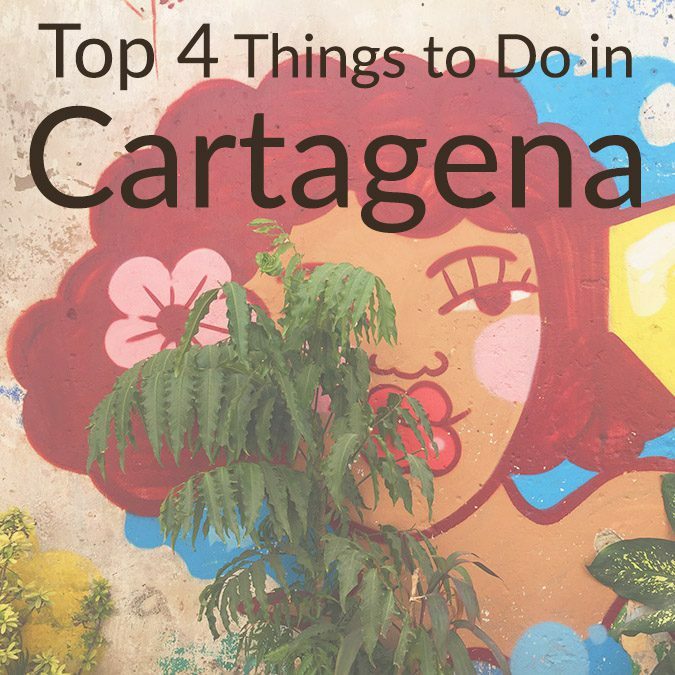 It's traditionally a fishing port so it's filled with all types of boats - small lanchas or motorboats, catamarans, and a few yachts. The infamous Jesus Statue (the second largest in the world) is perched at the top of the cliff at the far north side of the bay. It's a beautiful place to watch the sunset, or have an evening drink at one of the many beachfront restaurants. 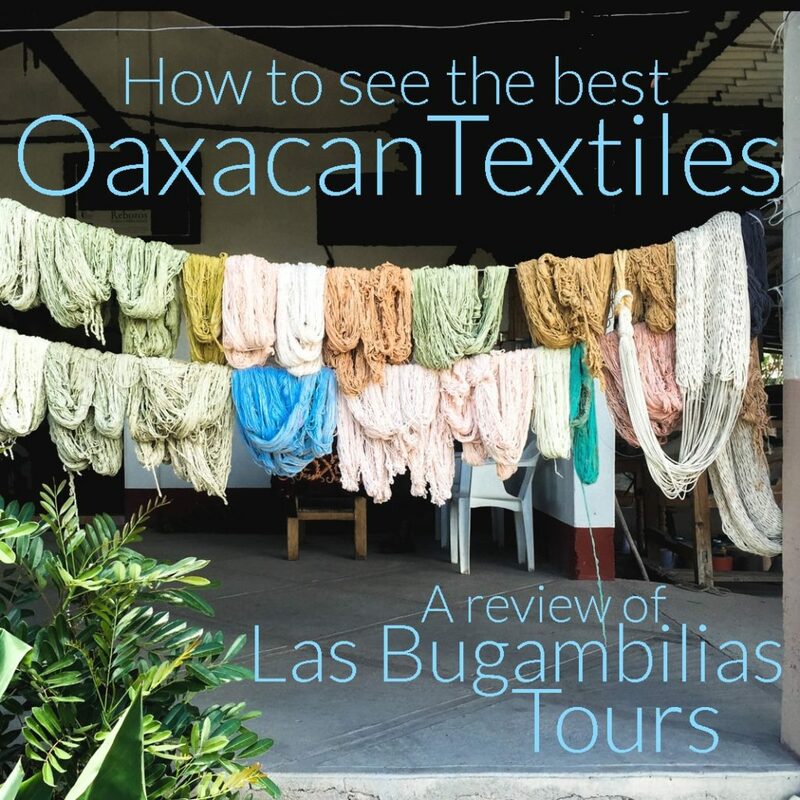 If you're staying in San Juan del Sur, it is a couple minute walk from almost anywhere. The water here is extremely calm (making it a great fishing port) so it is possible to go for a dip in the ocean. I wouldn't say it is dirty, but the water doesn't have the fresh, clear, turquoise look it has at most of the other nearby beaches. 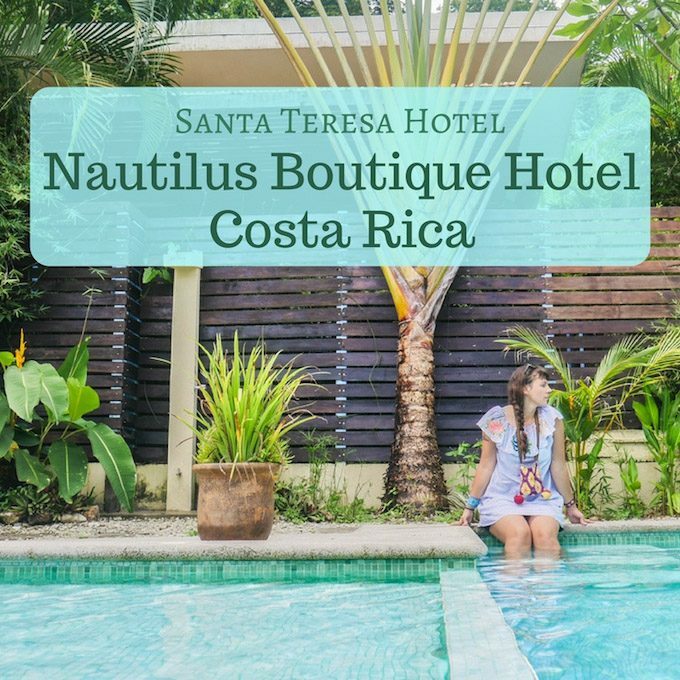 It's a great place to take a quick dip to cool off during your day of exploring the town, or after a strenuous hike up and back from the Jesus statue. 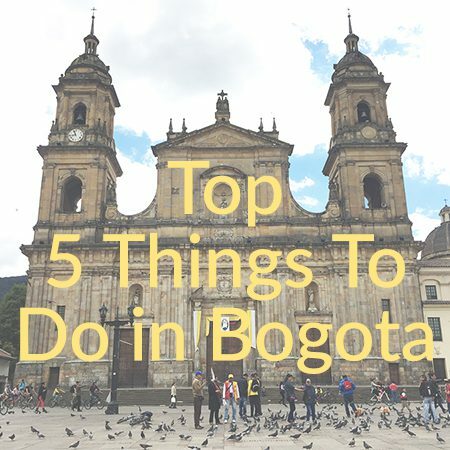 There are countless options here - tons of restaurants, cafes and bars. 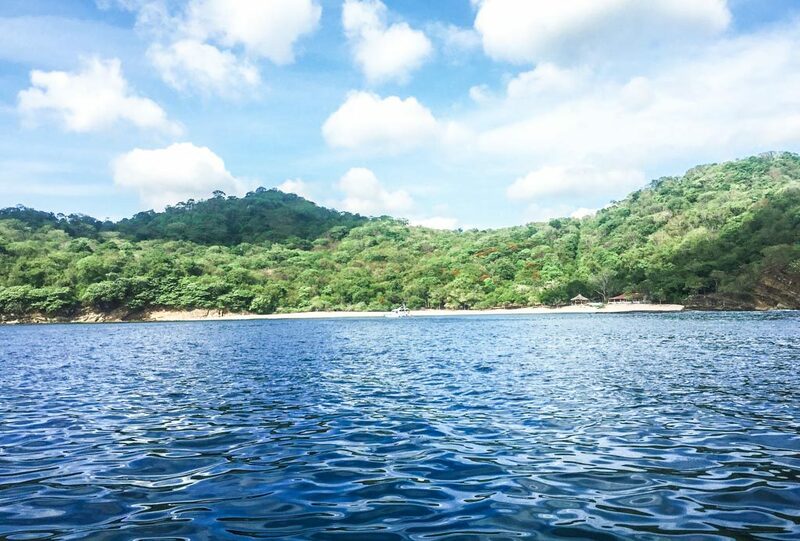 San Juan del Sur beach is the place to find a boat expedition into the Pacific. 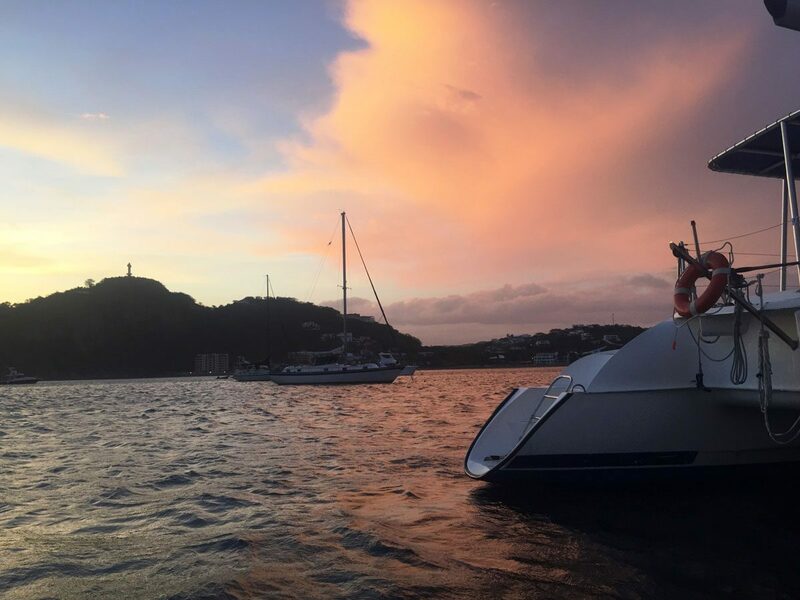 Many companies offer private boat rides for fishing, snorkeling or exploring. It's also a great place to get lunch, dinner, or watch the sunset. You have tons of options here in all price ranges! 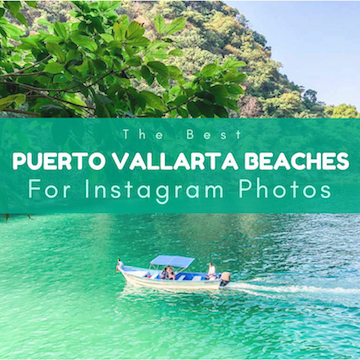 Below are a few of the highest rated in San Juan del Sur beach town. Elementos del Sur - Booking.com score of 9.2/10. Average price $99/USD night for a private double room. Nicely designed rooms and spaces. Pool, breakfast included, 1 minute walk to the beach. HC Liri Hotel - Booking.com score of 8.9/10. Average price $65/USD night for a private double room. Colorful decor and comfortable rooms, pool. 5 minutes walk to the beach. Nuestra Casa - Booking.com score of 9/10. Average price $43/USD night for a private double room with private bathroom. 2 minute walk to the beach, pool, ocean view. 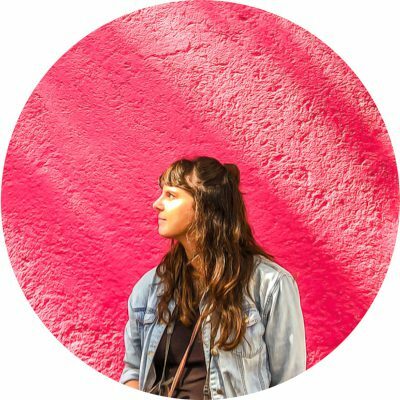 Casa Romano Hostel - Booking.com score of 8.7/10. Average price $30/USD night for a private double room with private bathroom. 1 minute walk to the beach, shared kitchen. One of the many beachfront palapas for relaxing or enjoying a cerveza. 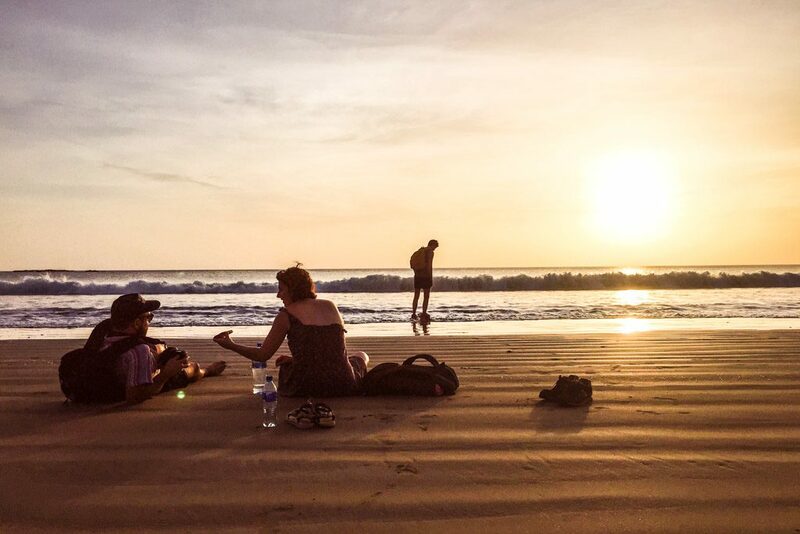 Playa Hermosa translates to "Beautiful Beach" and that is exactly what it is. This was absolutely one of my favorite San Juan del Sur beaches along the southern coastline. We arrived midday on a Sunday and somehow only shared the long sandy beach with a handful of other people. There is a restaurant, bar, and countless palapas and seating areas up and down the beach. Comfortable hammocks, wooden swings, and picnic tables make for a nice place to camp out for the day. 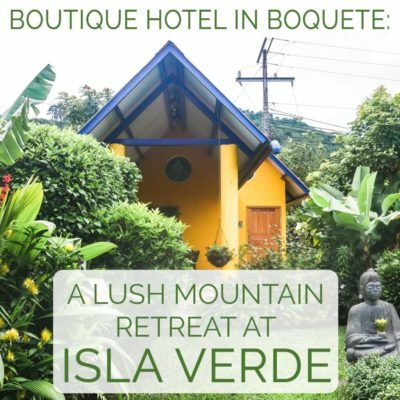 Shuttles make the trip from San Juan del Sur for $10 roundtrip. This covers the $3 entrance admission. 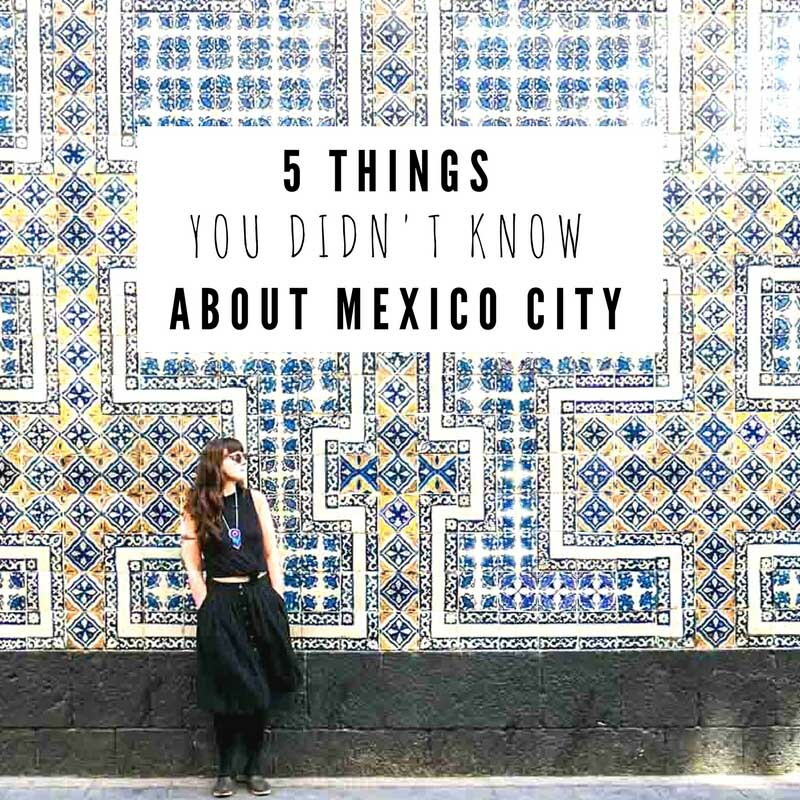 You can also drive or take a taxi - it will take about 30 minutes from town. Be advised that once you turn off the main road, you have to drive down a very long, windy dirt road to get to the beach. Don't worry, it's worth it! The $3 admission is also worth it - it's a beautiful, clean, well maintained beach. 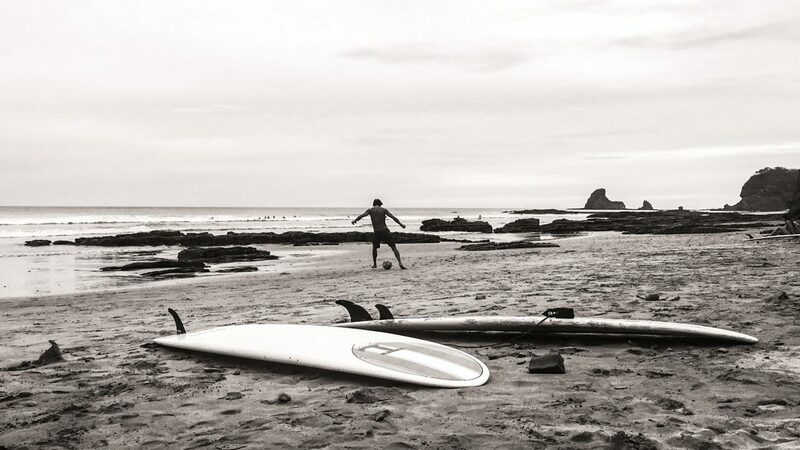 There is some surfing at Playa Hermosa. 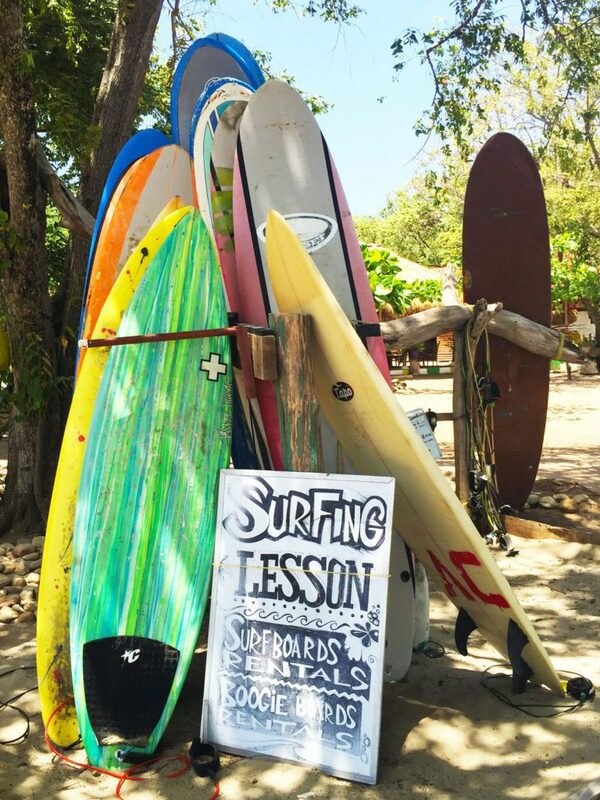 Board rentals and lessons are available. This is a good spot for beginners. This was one of the best ocean swims I've ever had in my life. 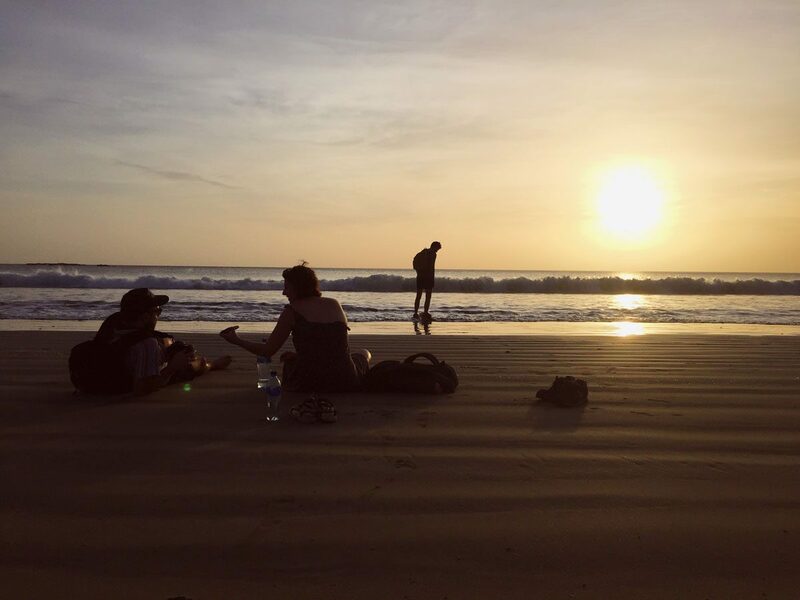 The sea at Playa Hermosa was incredible - the waves were just big enough to be fun to jump over and into, but not too rough. We laughed and swam and jumped around for a long time, and still wished we could have spent more time here. We didn't eat here but there is a restaurant and bar, which also provide "table service" to the palapas on the beach. A truly beautiful beach, a relaxing day, and an amazing swim. 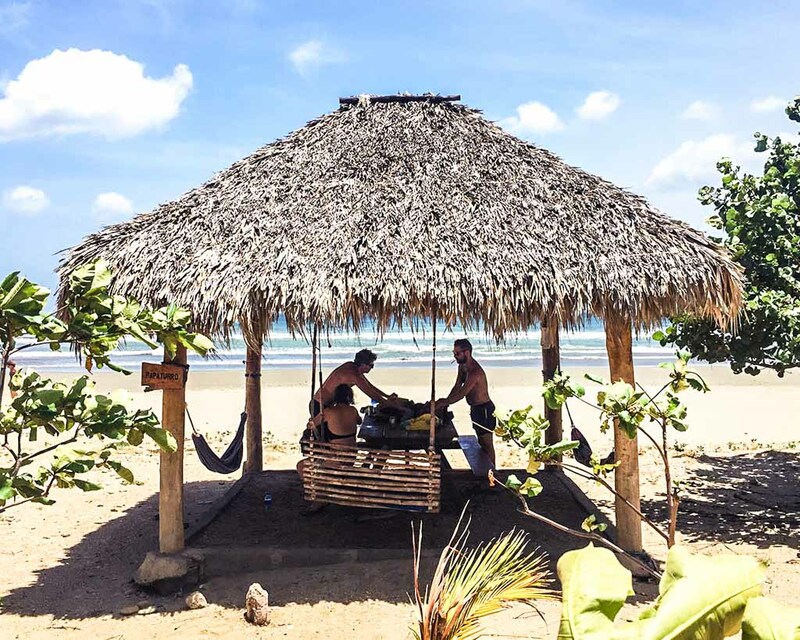 Playa Hermosa Eco Resort - Booking.com score of 8.3/10. Average price is $100/USD night for a private double room. This is the only hotel actually on Playa Hermosa beach. Comfortable rooms, beach ambiance. Villa del Loma Socorro - Booking.com score of 9.9/10. Average price is $130/USD night for a private double room. This hotel is off the main road back 4km from the beach. Beautifully decorated and luxurious, breakfast included. View of the beachfront restaurant and handful of hotels at Playa Coco. Playa Coco would have left a stronger impression if it hadn't been bookended by two amazing San Juan del Sur beaches in the same day (Hermosa and La Flor). It's a picturesque beach. It is a long, flat sandy expanse sandwiched between dramatic sheer cliffs on each side. We stopped here for lunch and admired the beach, took a quick dip, and then headed back on our way. This is about 45 minutes to an hour south of San Juan del Sur. No shuttle exist that I know of, you would need to rent a car for the day or take a spendy taxi. 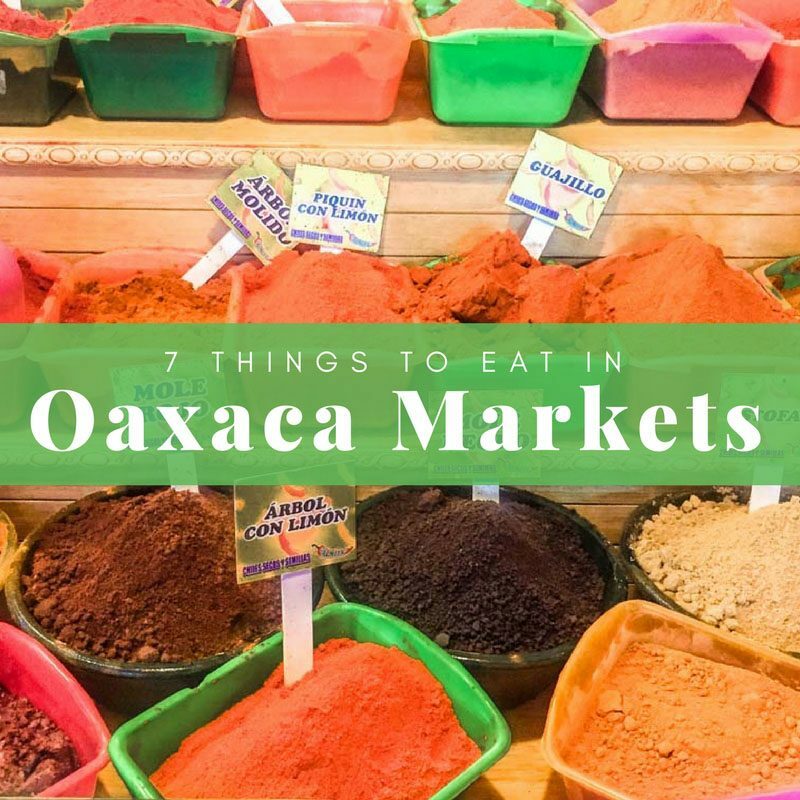 You can also take a chicken bus from the municipal market in San Juan del Sur heading to El Ostional and ask to be let out at Playa Coco. 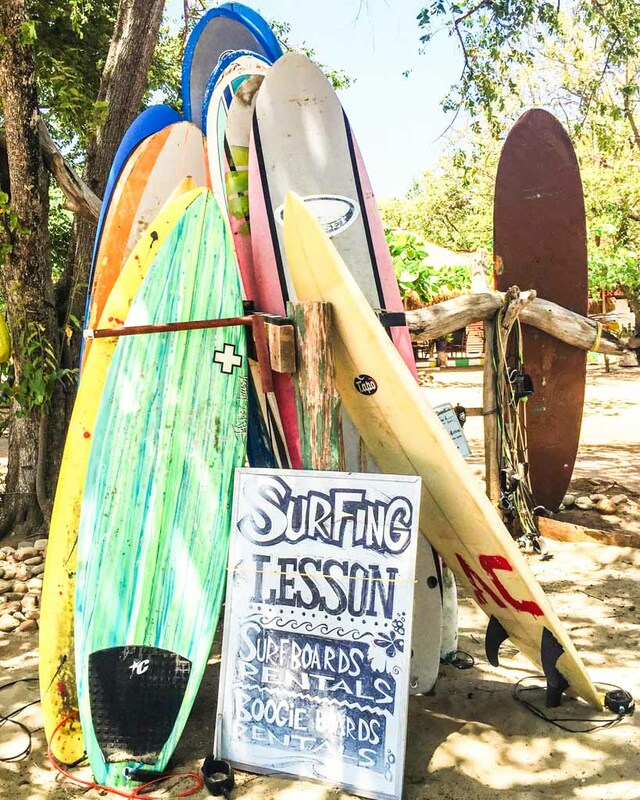 The surfing at Playa Coco is good for beginners. 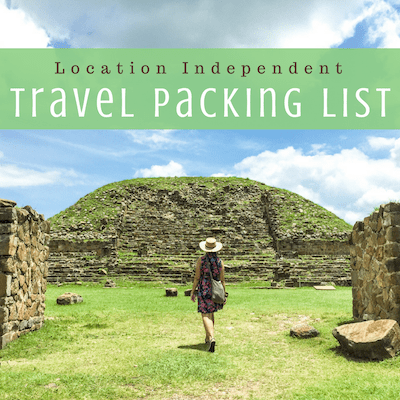 However you must bring your own board, or rent from town in San Juan del Sur and bring it with you. Generally a nice calm swim. We ate at the only restaurant on the beach - Puesto del Sol. It was so-so. Food was pretty Americanized and the prices were quite high for the area. Renting a car for the day and stopping at a few of the southern San Juan del Sur beaches down the coast. 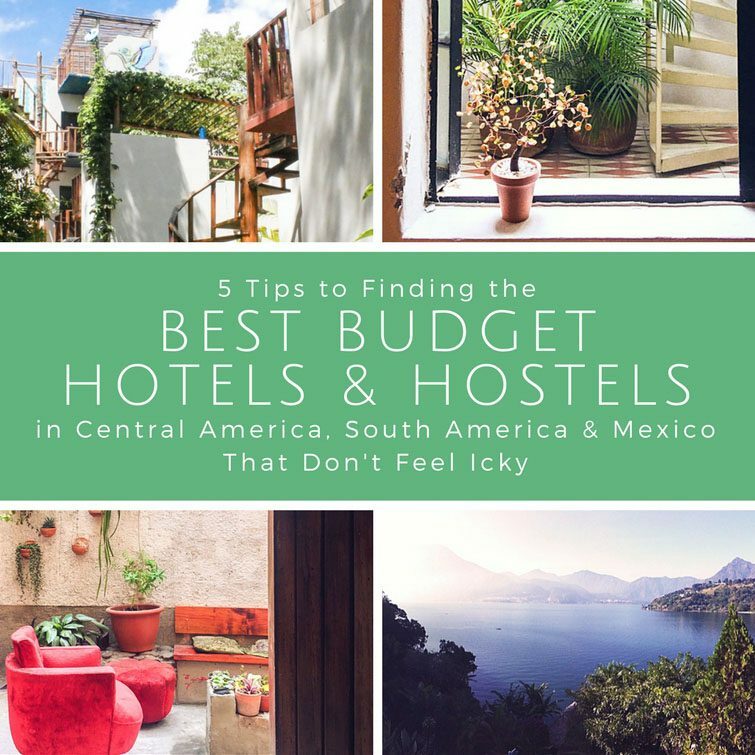 Costa Dulce Hotel - Booking.com score 9.6/10. Average price $138/USD night for a private double room. 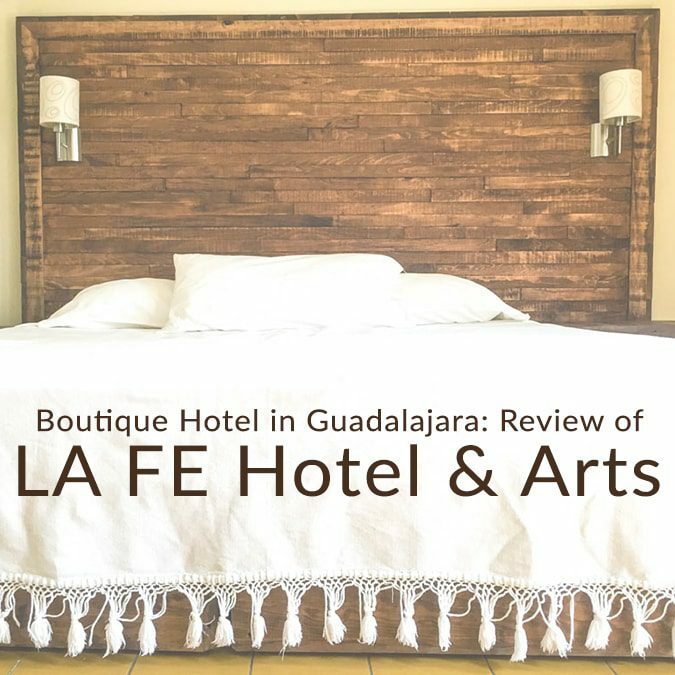 This hotel is not on Playa Coco, but is nearby on the beach of Playa Escameca. 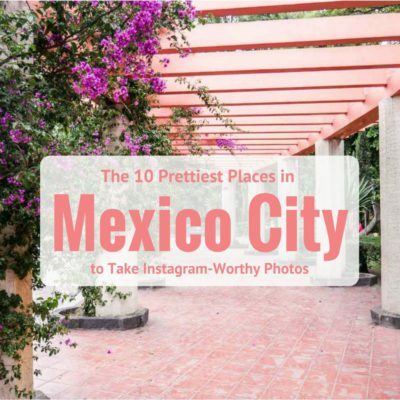 It has great reviews, is well decorated, has a jungle location with an ocean view. Breakfast included. Casa Piancito Playa el Coco - Average price is $190/USD for a house that sleeps 8. Full kitchen, 4 bedrooms. Los Volcanes Playa el Coco - Average price is $120/USD for a private studio home with full kitchen. Pool. Our first turtle sighting at Playa La Flor. Most turtles arrive on the beach after 9pm, but this lone turtle started early. Trees growing out of the sand at the water's edge. 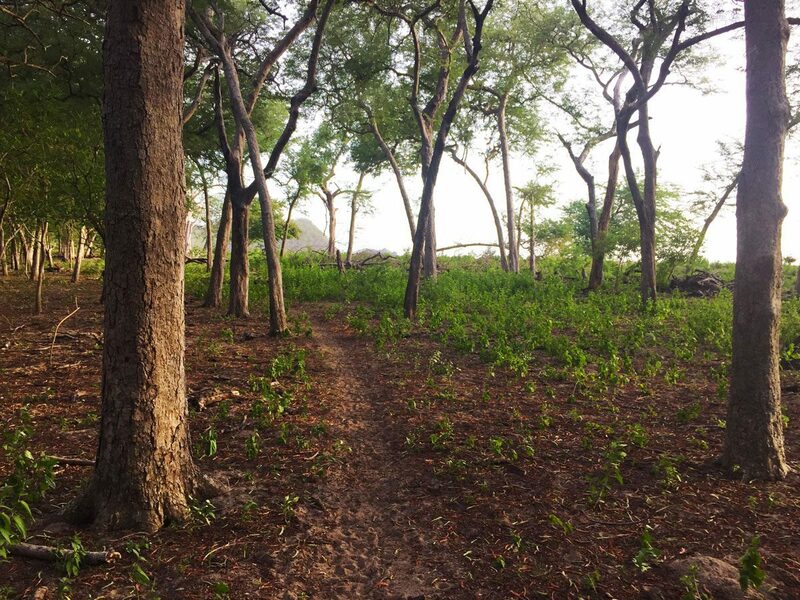 Walking on the forest path next to the beach. Watching sunset at the nature reserve, anticipating the turtles' arrival. 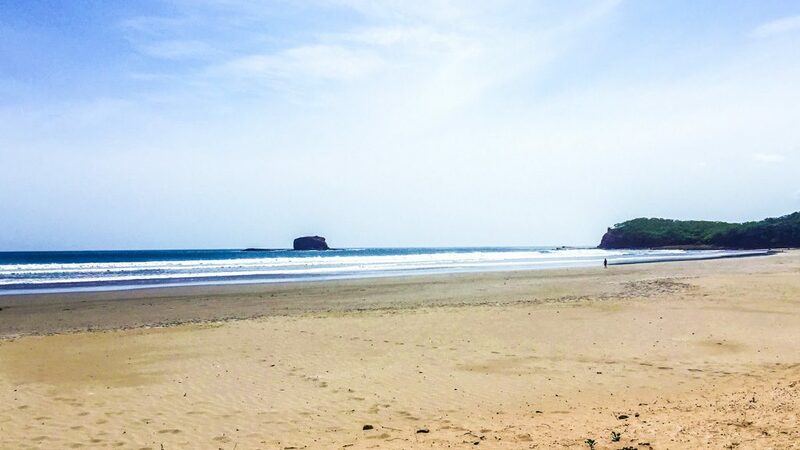 Playa La Flor isn't like the other San Juan del Sur beaches, it's a Nature Reserve. It's a bit far south from San Juan del Sur, making it remote and dramatic. Upon entering, you must pay a small admission for the running of the reserve. The beach is known for turtle nesting, but it is also an incredibly wild and beautiful beach. We arrived in the late afternoon one day - we wanted to see the turtles nesting after dark, but wanted to come before sunset to see the beach and explore a bit. The park rangers are friendly enough and will answer any questions you have. We headed out to the beach for a quick dip. It was so tranquil, we were literally the only people on the beach. 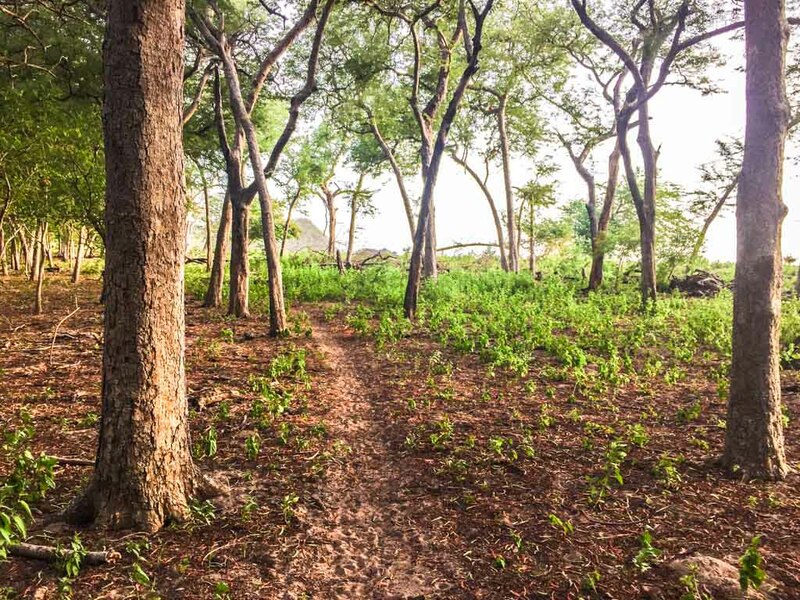 We then took some time to walk down a hiking trail, explore a mangrove swamp, and then head back to the beach for sunset. You can take a chicken bus from the municipal market in San Juan del Sur heading towards El Ostional and ask to be let out at Playa La Flor. 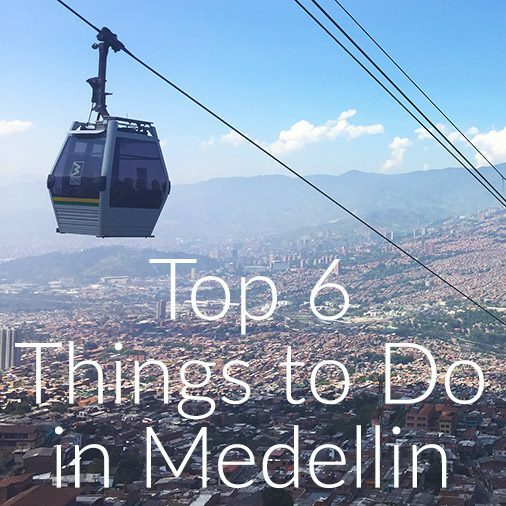 Or you can book an evening turtle tour through one of the many hostels or tour agencies in town. 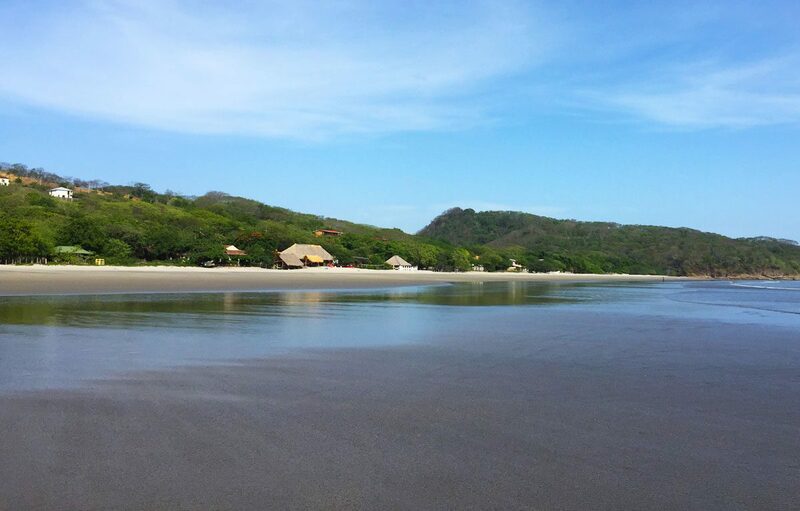 If you prefer to see Playa la Flor during the day as well, renting a car and heading south to tour some of the southern San Juan del sur beaches is a great option. 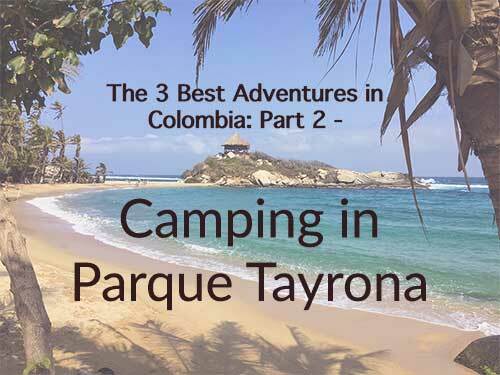 Admission is $200 Cordobas, If you want to camp it costs $500 Cordobas per tent (must bring your own tent/camping equipment). Playa la Flor is a nice beach for swimming. It's incredibly calm, so it's good for a dip or quick swim. There are no amenities here - you must bring in food/drink/water with you! Seeing big beautiful turtles emerge from the sea after dark, climb up the beach, dig a hole and lay their eggs before returning to the sea. I highly recommend to do what we did though, and arrive before dark. The Playa la Flor beach is rugged, wild and beautiful. 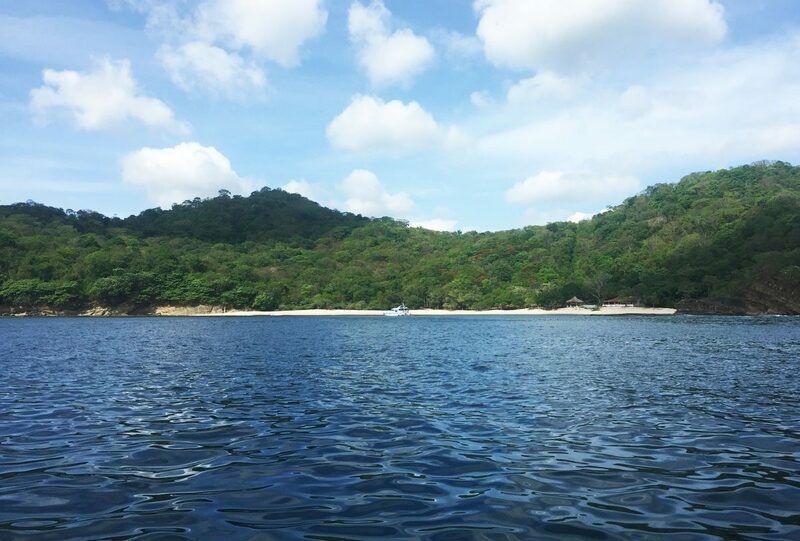 You will see a lot of birds and sea life, and it's really nice to explore the coastline and forest. Bring a picnic dinner or snack, sit and watch the sunset on the beach, and then patiently wait for the turtles to arrive around 9pm. Camping is also possible here if you want to stay longer. 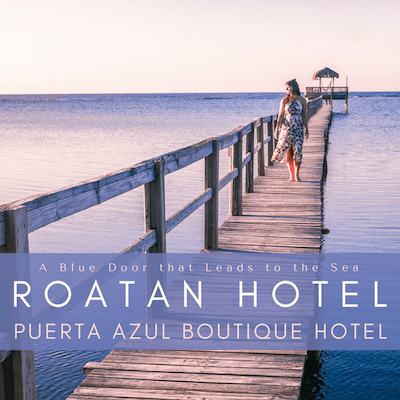 There are no hotels near Playa La Flor. There is an option to camp, but you must bring in all your equipment. 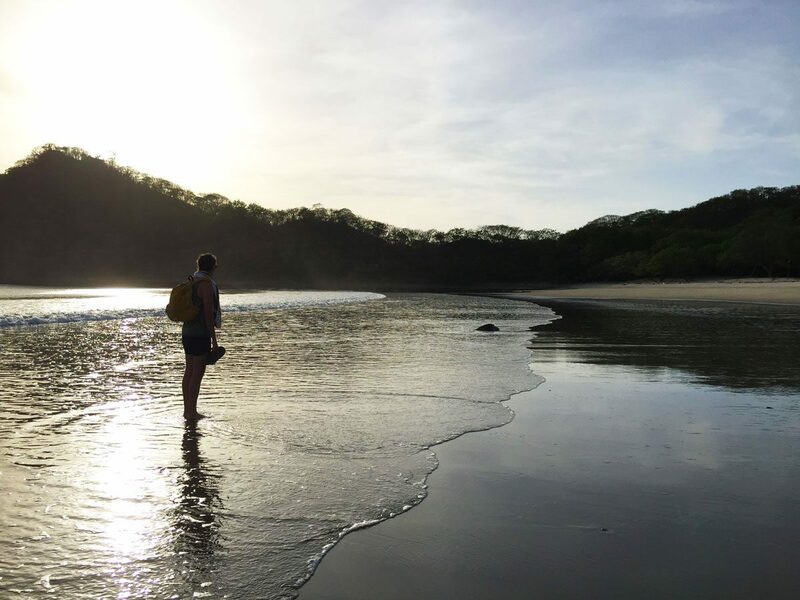 I would recommend staying in one of the nearby properties near Playa Coco, or just stay in any of the above San Juan del Sur beaches, and make a day or evening trip to see Playa La Flor and the turtle nesting. 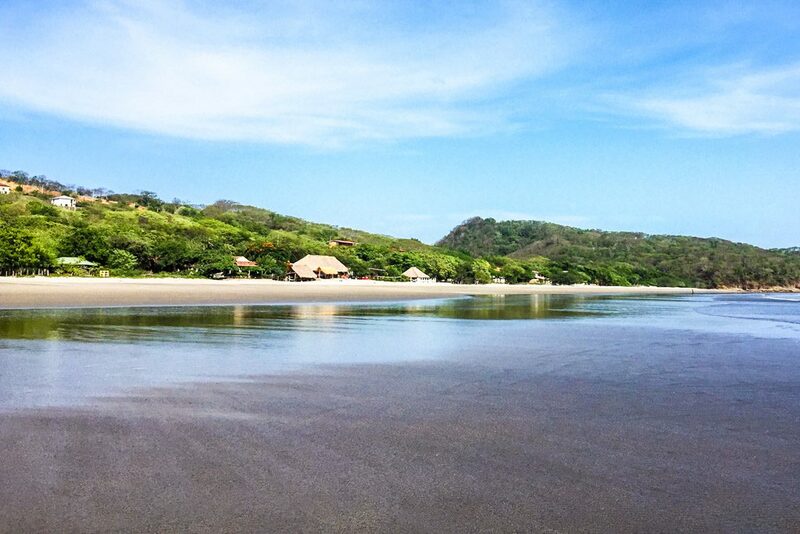 Each San Juan del Sur beach is so unique and special in it's own way. 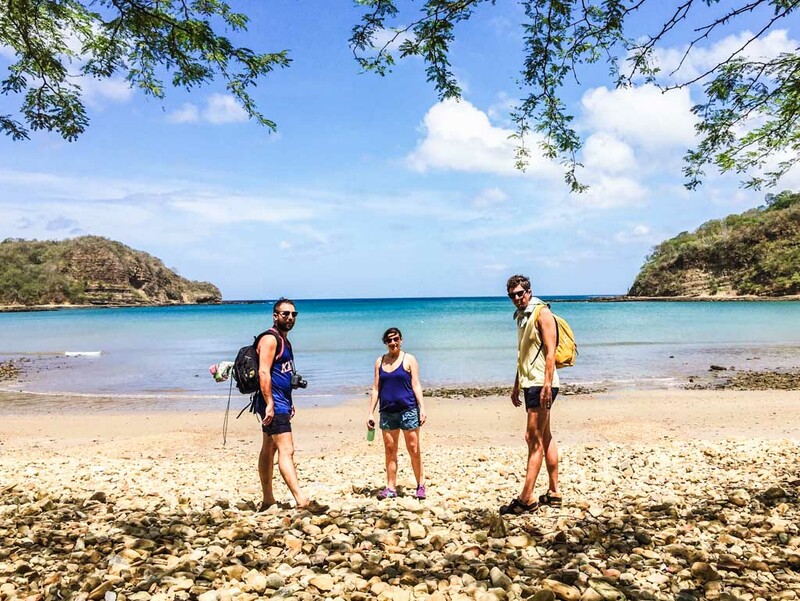 Part of the fun in staying in San Juan del Sur is to explore all the different personalities of each one. My must-go's were Maderas, Hermosa, and La Flor, but I'm really glad we took the time to get to know each one we went to. Next time I'll have to try to fit in the countless others I missed! 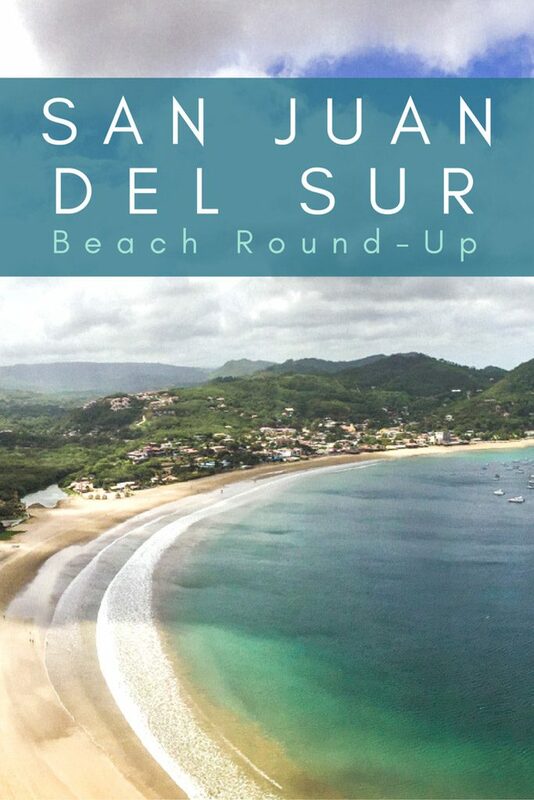 Grab my San Juan del Sur Beaches Map Below! 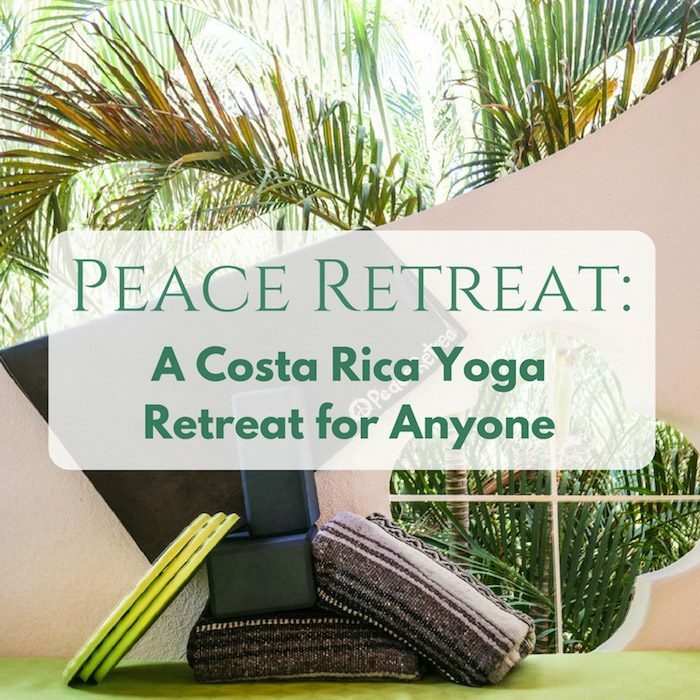 Includes all the San Juan del Sur beaches plus the best accommodations near each one (Including prices, amenities and links to book!). I’m intrigued about the camping on the beach – what more can you tell me about this? Do they provide the tents? How buggy? I don’t have experience camping at La Flor, but I believe you’d have to bring your own tent and supplies. There aren’t any amenities there, only a small building that gives out information and takes the admission fee. 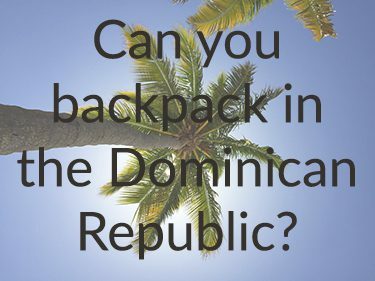 You’d need to bring in all food, water, and camping supplies. It’d be worth it though, the beach is usually totally empty outside of turtle nesting hours at night (from July to January). Let me know how it goes if you try it! 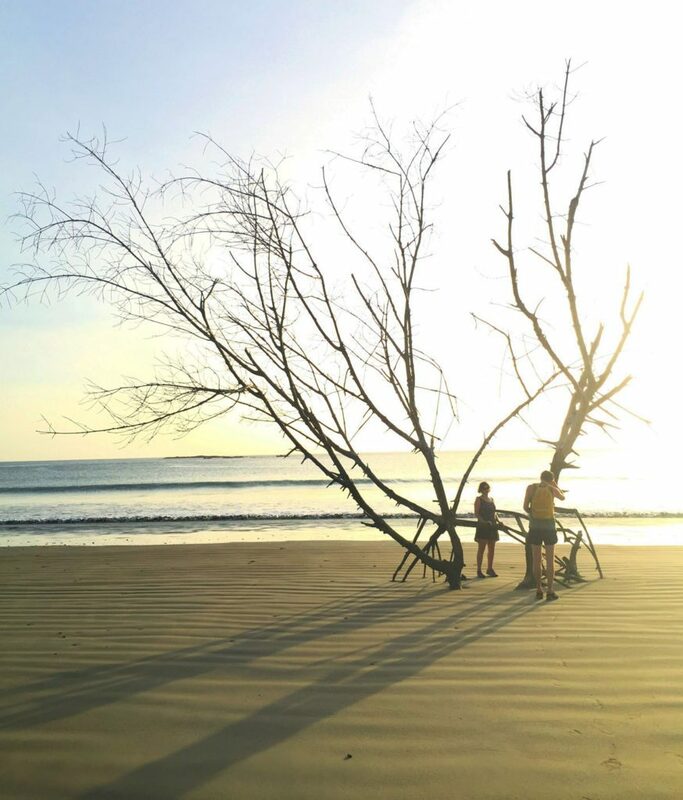 Great round-up of Nicaraguan beaches! 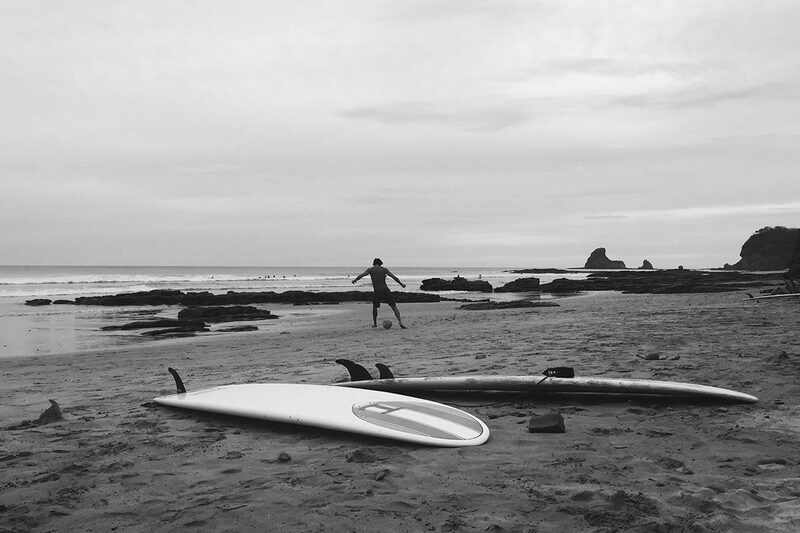 Loved the photographs, particularly the black and white of the beach and surf boards. I do think I’d avoid the beach that the locals were warning about the ongoing problems with local thieves. But there are so many other great beaches here to try! Thanks for your kind words! Yes, there are so many different types of beaches within a few minutes of each other, there are so many great options! Hhhhmmm. I have been thinking about taking surf lessons. 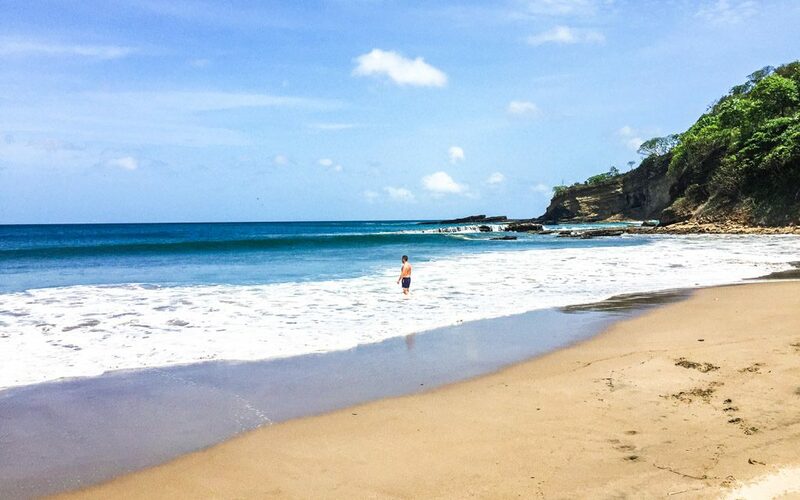 I’d never considered a beach in Nicaragua as the place to do it, but these beaches look beautiful! I love undeveloped, natural beaches. So much more appealing to me than the white sand beaches where you can barely find room to lay down a towel. 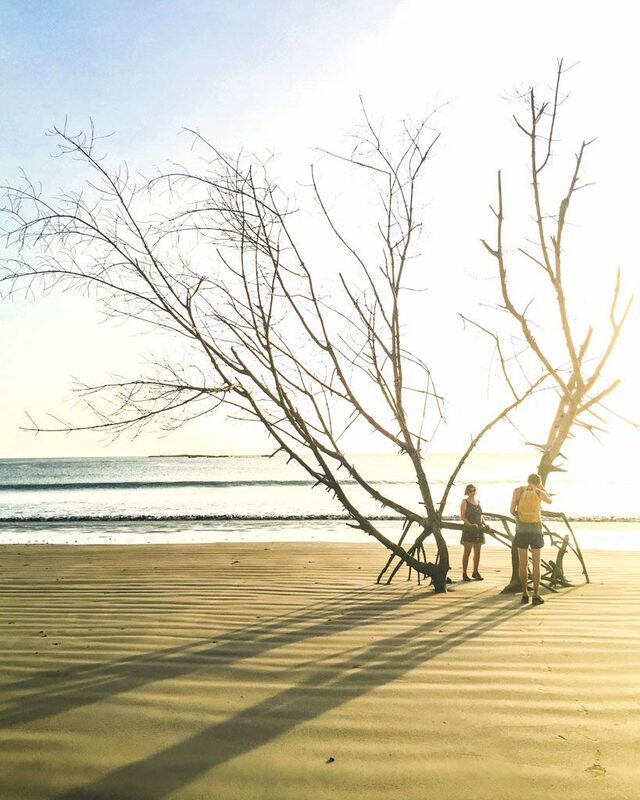 There are so many beaches to explore in Nicaragua. You were totally spoilt with choices there. 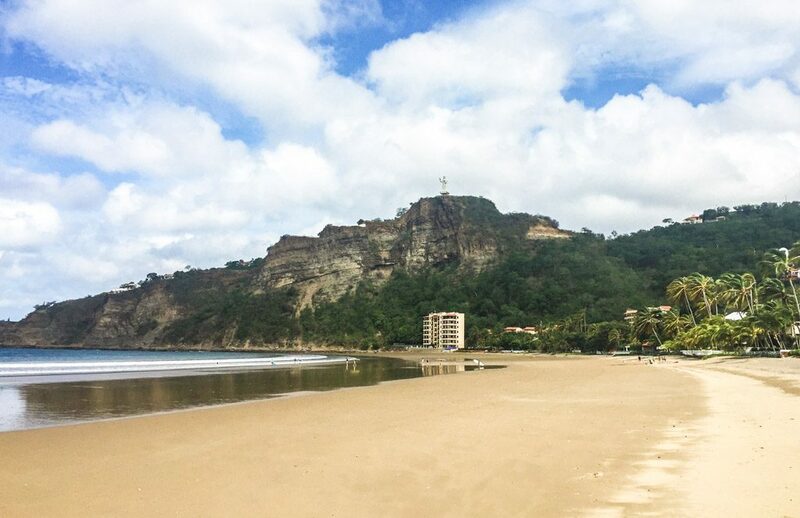 I love the look of San Juan del Sur Town Beach, so nice to have a lovely beach right in the city. I have been dreaming of a surf safari to Nicaragua for some time, but not up to planning specifics. It is fascinating how distinct the breaks are for each of these beaches. In San Diego, the vast majority of the breaks are western facing beach breaks with North County beaches hooking over a little bit more. There are a few small reef breaks that you could hit. I wonder if it’s the underwater topology or the direction that the bays face that is driving the difference in the breaks down there. I’ll make sure that I figure out exactly what the beaches offer before I solidify our plans. Glad this post was helpful! 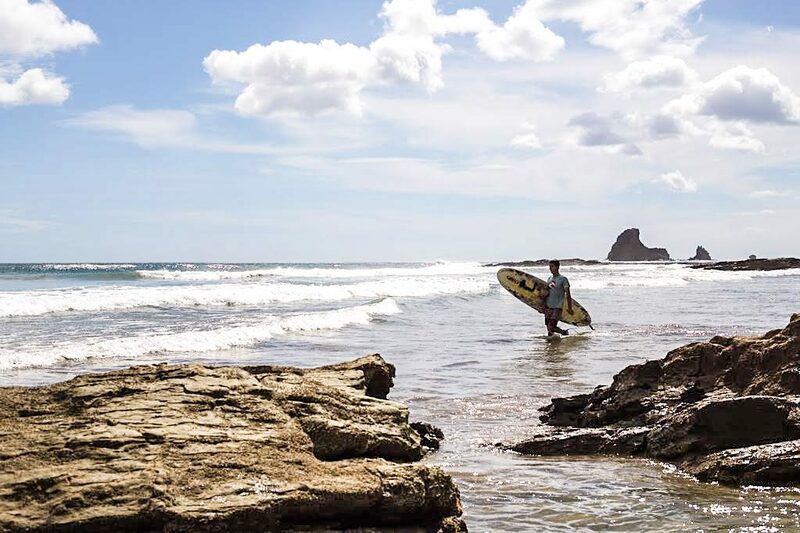 Nicaragua is a perfect place to take a surf trip. I’m not well schooled on this, but I’ve been told that the unique surf patterns in Nica are a result of the winds that come from two directions – 1st) over the ocean and 2) in the opposite direction coming from Lake Nicaragua. 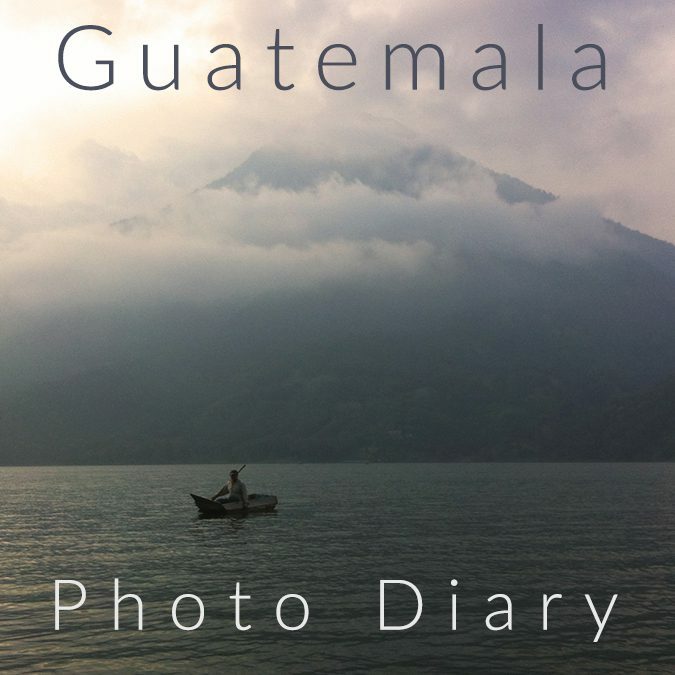 The Lake is the largest in Central America, and the strip of land where the surf is best is actually very narrow between the ocean and the lake. Think this is what makes for the great waves, and also the distinct breaks at different beaches. There are so many great options near SJDS! Playa La Flor sounds like a great one for turtle spotting and sunset viewing. 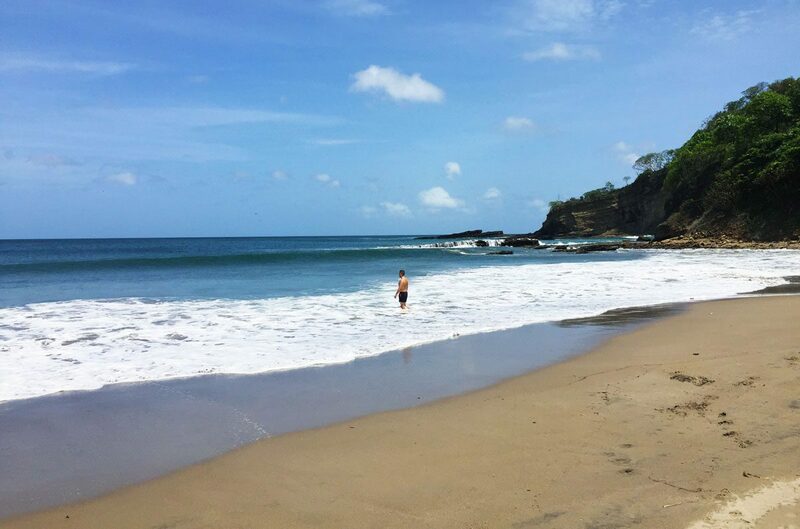 Playa Hermosa is a wonderful choice for a good swim! So many beautiful beaches! 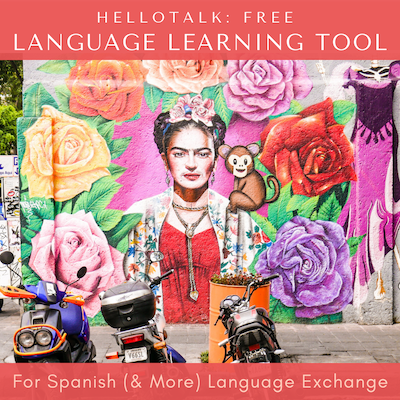 This is a great roundup with a lots of great tips and suggestions! Thanks so much for your comment and kind words! Thanks for all the information. 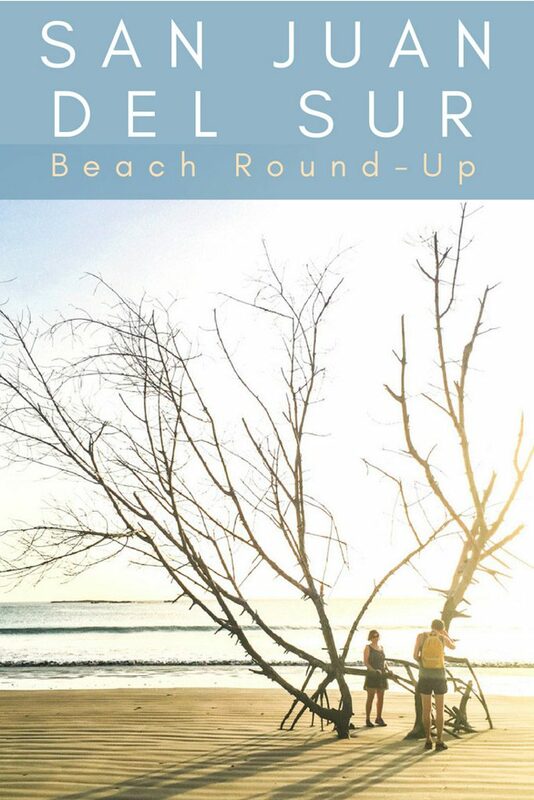 Is there a beach you would recommend for younger children – ages 6 & 8? We’d like something calmer (concerned about rip tides, big waves), so would like more swimming. That said, some smaller waves for boogie boarding would be great. Not sure if I’m asking too much on this front?? Great question. It is a little tricky since Pacific beaches tend to be on the rougher side. But I think you can make it work. The city beach at SJDS is very calm – but it is not the prettiest. Playa Blanca is also very calm and totally beautiful. 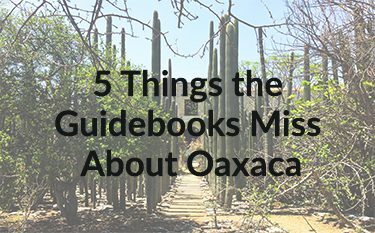 You can only get there by boat, but you could hire a lancha in town and take it out there for the day. That might be a lovely day trip. From what I remember about Maderas and Marsella – the waves tend to crash a bit further out. So it should be possible to wade, splash, play in shallower waters closer to shore. I would also pay attention to the tide schedule. If you can visit the beaches during low tide it should be calmer. 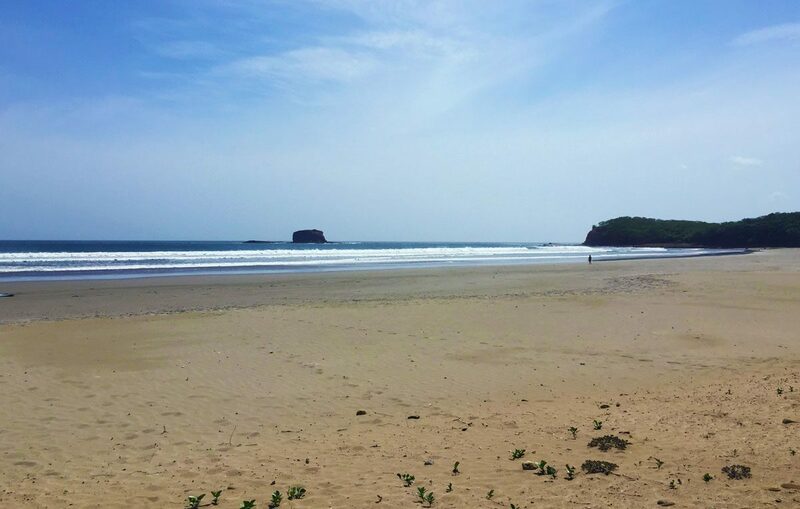 Playa Hermosa was a wonderful swim for us, but might be a little too intense for children. But again, I think you could stick to the parts closer to shore. I would guess it would be the same for Coco and La Flor (we didn’t swim at those two, but they did look pretty calm when we were there). I hope that helps! I would also definitely recommend asking your hotel, Airbnb, etc when you get there as things can change and ocean safety can vary a lot depending on storms or changes in currents. Definitely want you to be safe! But I think you’ll have a wonderful vacation. Let me know how it goes!